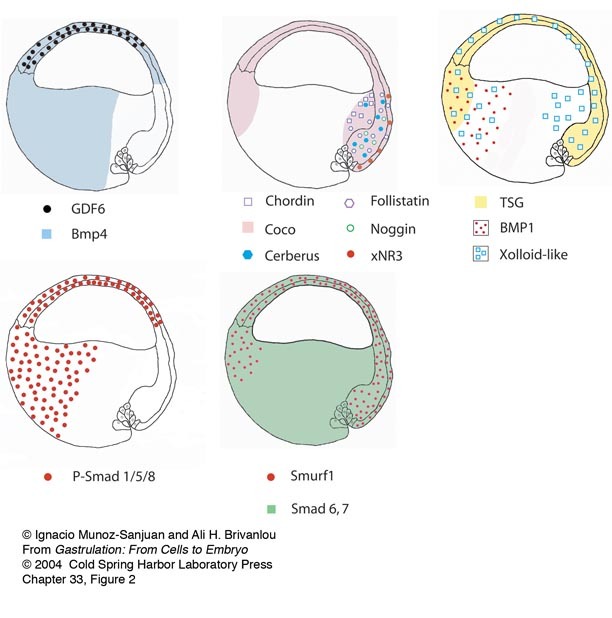 During gastrulation, the germ layers of an embryo are formed and the body plan of the mature organism is established. 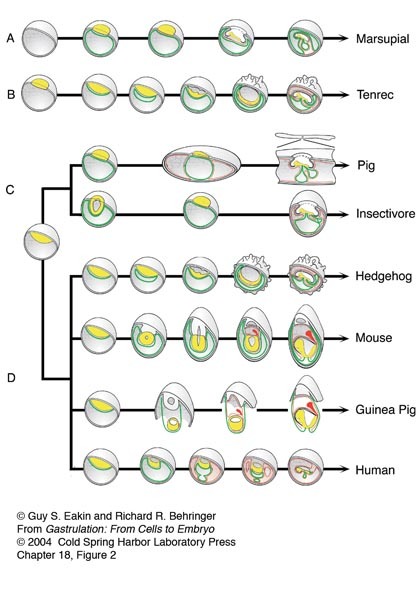 Movements on a massive scale allow cells to establish great complexity from a very simple starting form. 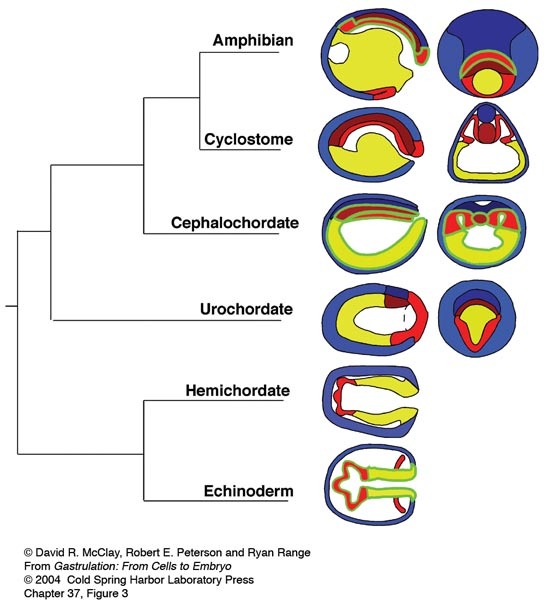 Evolution, exploring comparative aspects of gastrulation, molecular evolution, and embryo microfossils. 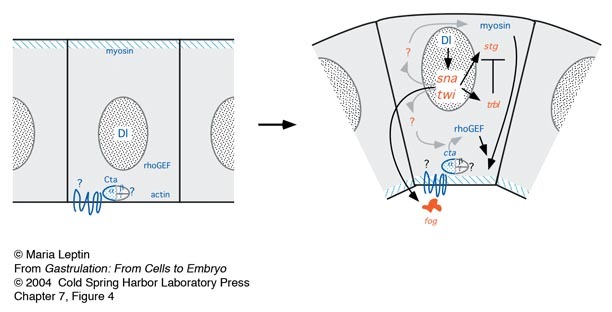 A detailed glossary of the language of embryology, a historical overview of the study of gastrulation, and a look at future research directions complete a volume that is essential for anyone interested in developmental biology, and is also a valuable source of information for scientists in other fields who study cell movement and differentiation. 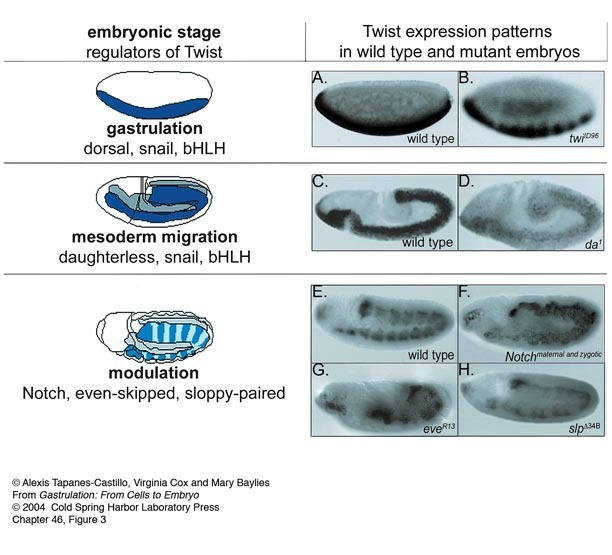 Cell ingressions during C. elegans gastrulation. 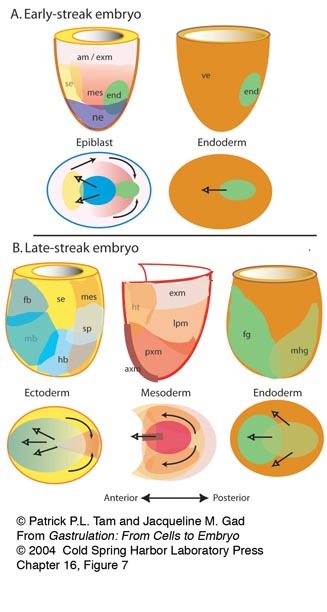 Gastrulation begins at the 26-cell stage with the ingression of the endodermal cells (asterisks), which move from the surface of the embryo into the interior before dividing. 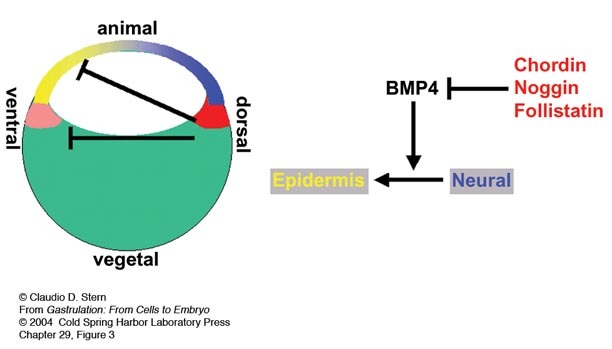 Embryo is 50 µm in length; timepoints are every 45 seconds for 28 minutes. 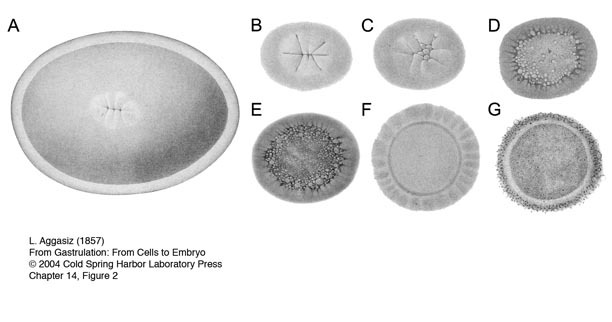 This movie shows the sequence of ingression of primary mesenchyme cells in the sea urchin. 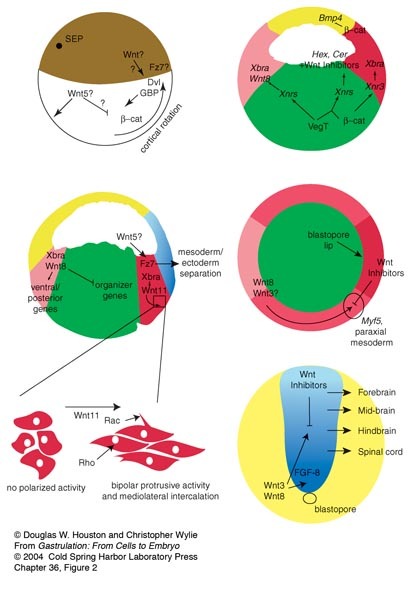 Micromeres at the vegetal pole undergo the epithelial-mesenchymal transition by becoming motile, changing a number of adhesion components, then movement of the cells into the blastocoel. 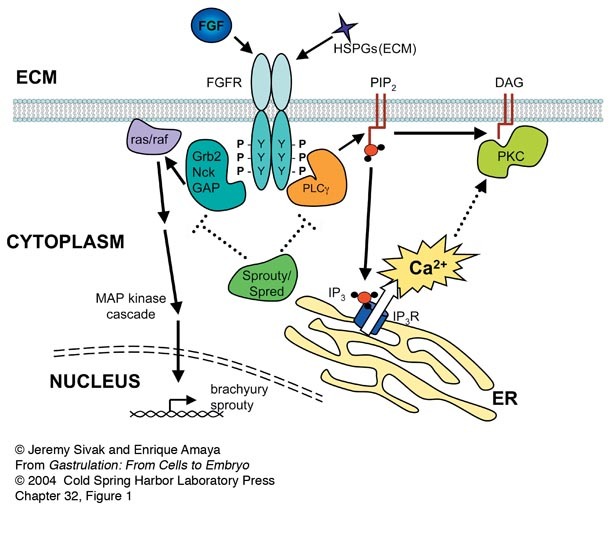 This movie shows ingression of GFP-labeled PMCs. 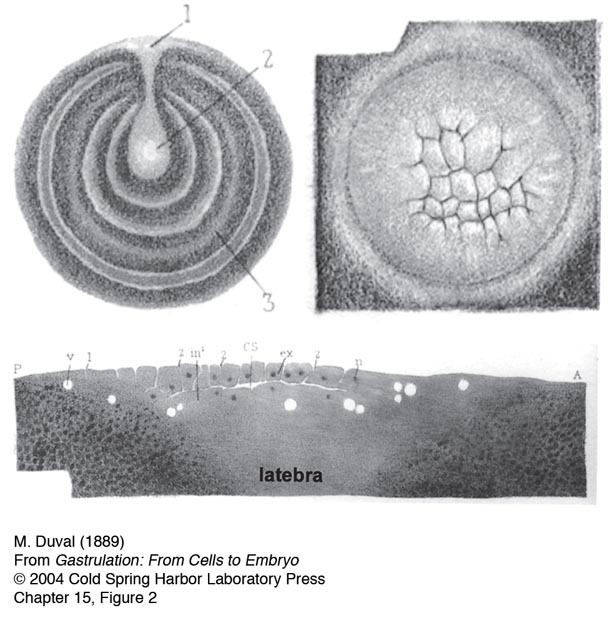 As can be seen the cells elongate during the process of ingression and much of the cell body is inside the blastocoel before the trailing edge of the cell pulls away from the hyaline layer on the outside of the embryo. 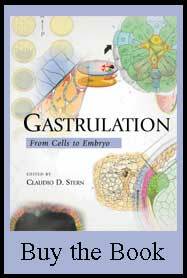 This movie shows the first third of gastrulation. 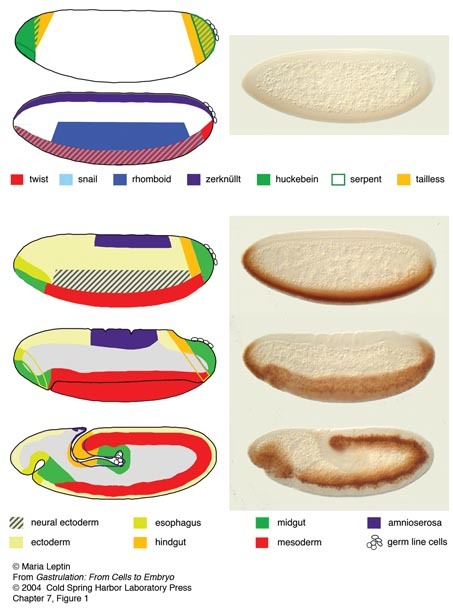 Beginning with a flattened vegetal plate the first sign of invagination is a central inbending of the cells at the center of the vegetal plate. 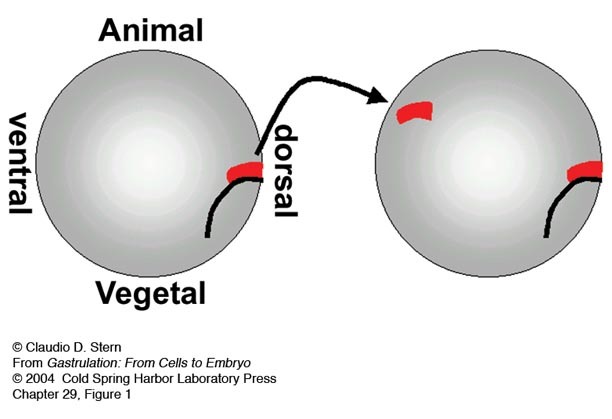 That primary invagination gradually extends to become deeper, and involve more cells of the vegetal plate. 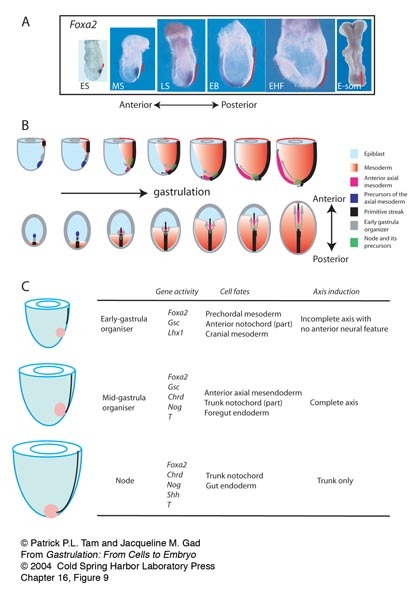 Much of this initial inbending is due to cell shape changes, and later in gastrulation convergent-extension occurs to further extend the length of the archenteron. 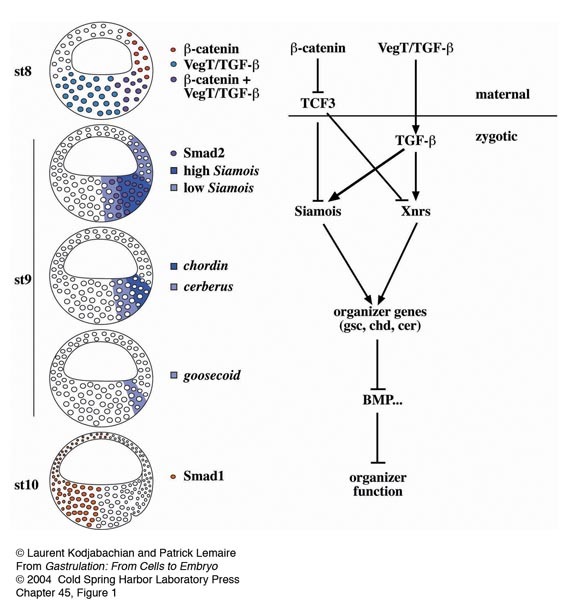 Xenopus laevis Vegetal View of Gastrulation & Neurulation: (15.0 hours elapsed, 48 minutes/second). 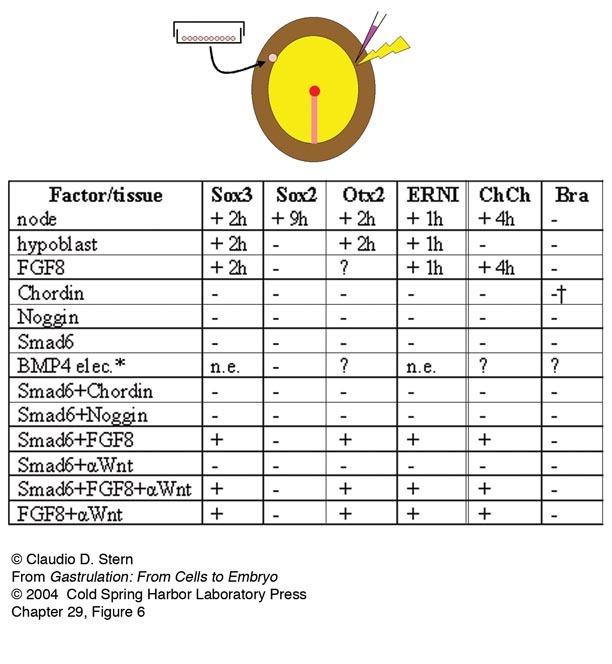 Refer to figures 1 & 2 in Gastrulation in Amphibians chapter. 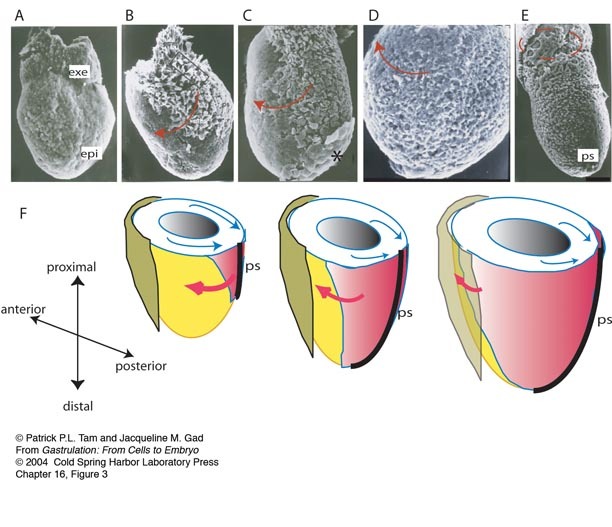 The movie shows gastrulation and neurulation viewed from the vegetal pole, the future dorsal side at the top. 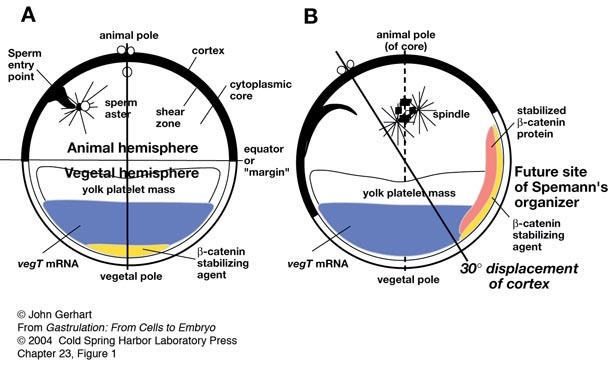 Note the dramatic involution of the IMZ, which forms an annulus or ring of cells surrounding the large central disc of vegetal endodermal cells at the center of the vegetal pole. 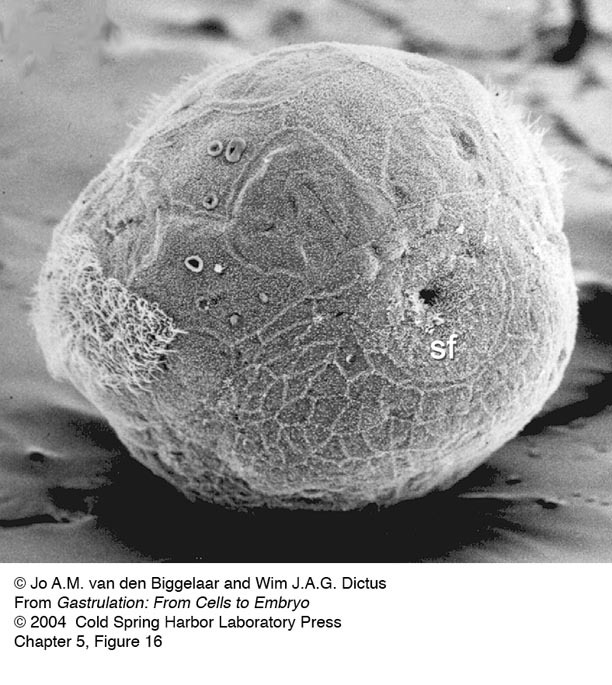 The bottle cells, marking the initiation of involution, have already formed mid-dorsally as indicated by the black pigment accumulation. 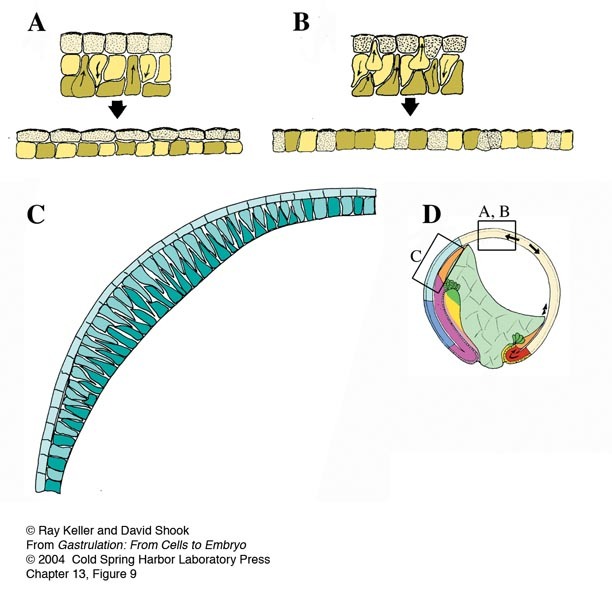 Note that the dorsal IMZ, region above these bottle cells rolls over the blastoporal lip and disappears inside; subsequently this involution proceeds laterally, on both sides, and finally at the midventral line. 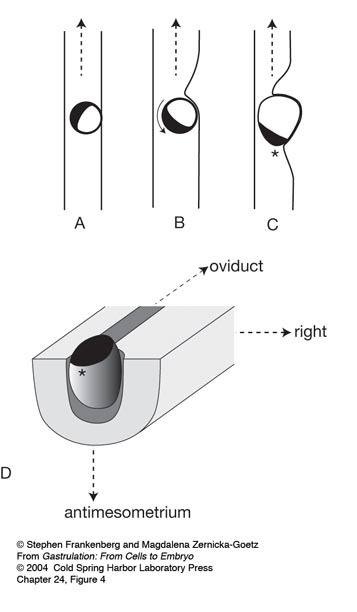 As the IMZ involutes, it also extends posteriorly and converges around the circumference of the blastopore, but does so inside, out of sight. 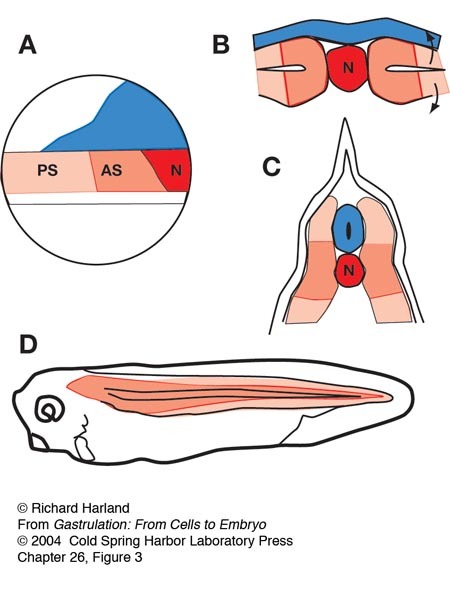 As it does so, note that the posterior neural tissue likewise converges and extends in the same fashion, on the outside; together these convergent extension movements squeeze the blastopore shut and simultaneously elongate the anterior-posterior axis of the embryo, pushing the future tail away from the head. 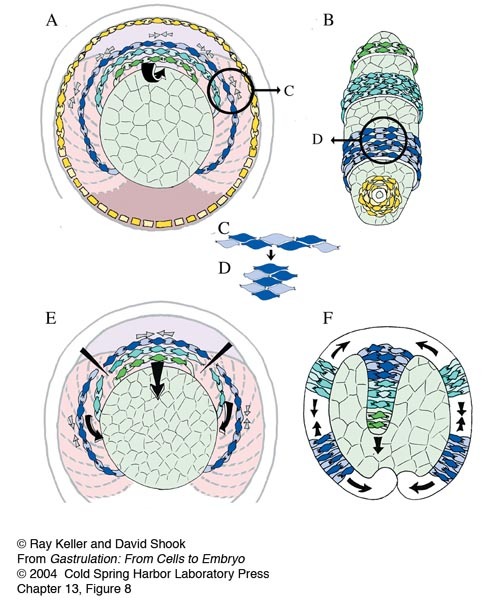 Note that the converging and extending neural plate simultaneously rolls up to form a neural tube. 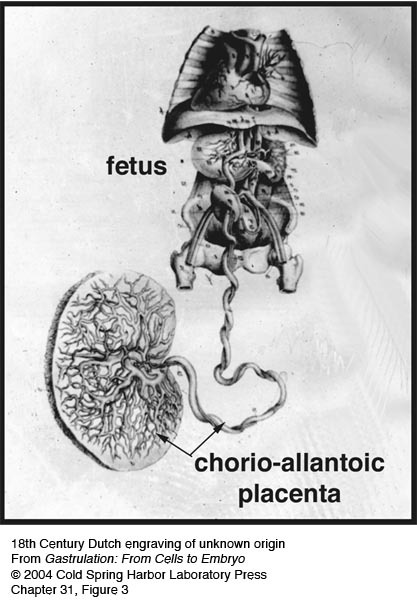 See Keller, R. 1975. 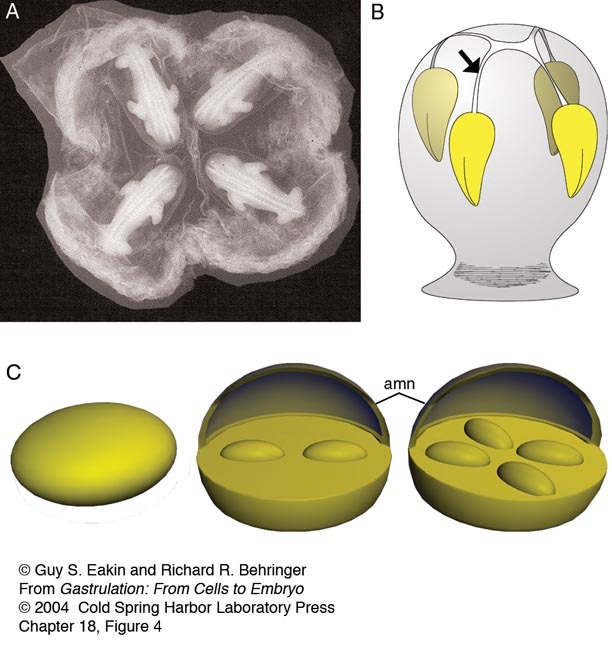 Vital dye mapping of the gastrula and neurula of Xenopus laevis. I. 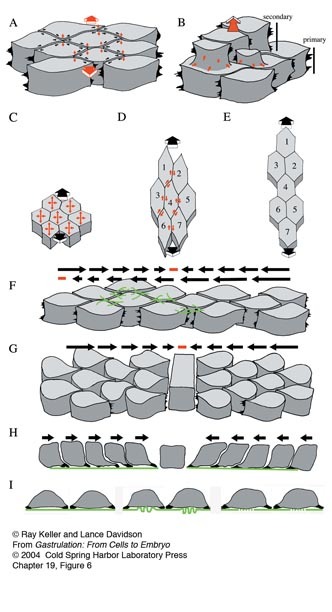 Prospective areas and morphogenetic movements of the superficial layer. Dev. 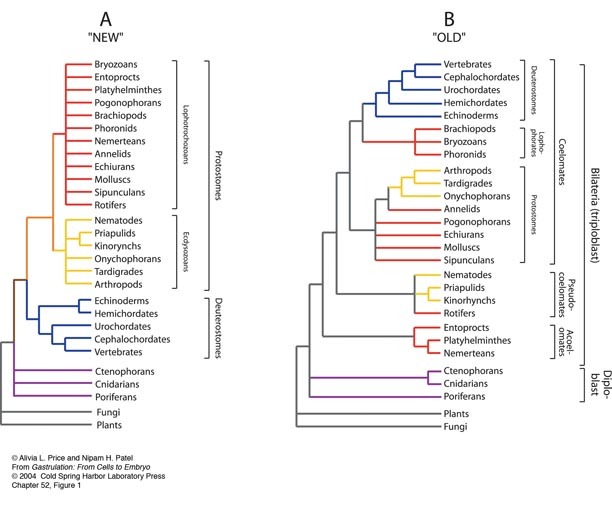 Biol. 42: 222-241; Keller, R. 1976. 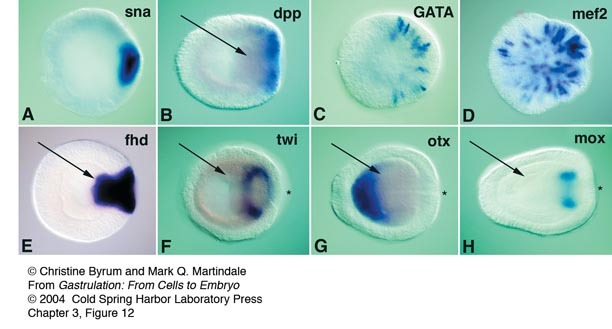 Vital dye mapping of the gastrula and neurula of Xenopus laevis. II. 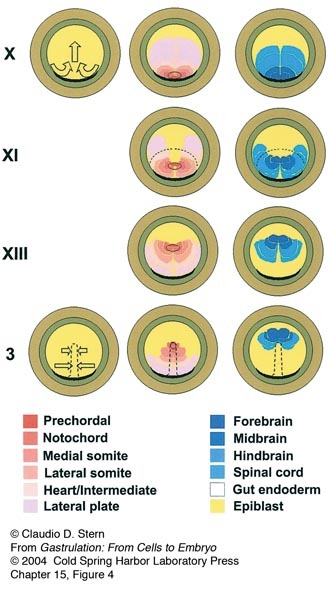 Prospective areas and morphogenetic movements of the deep layer. Dev. 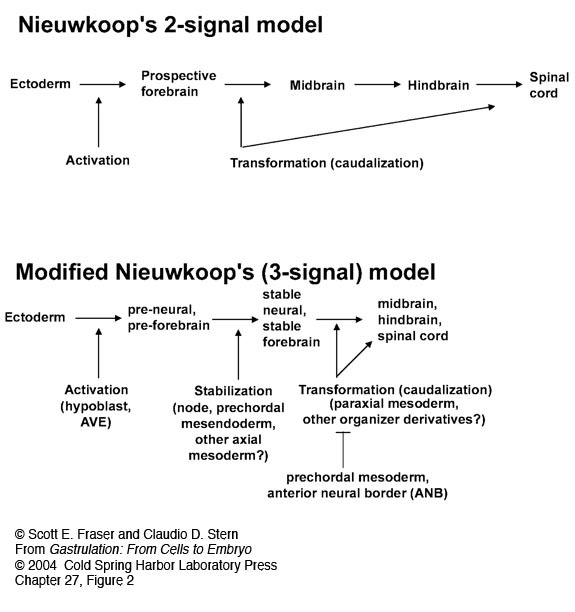 Biol. 51: 118-137; Keller R., Shih J., Wilson P.A., and Sater A.K. 1991. 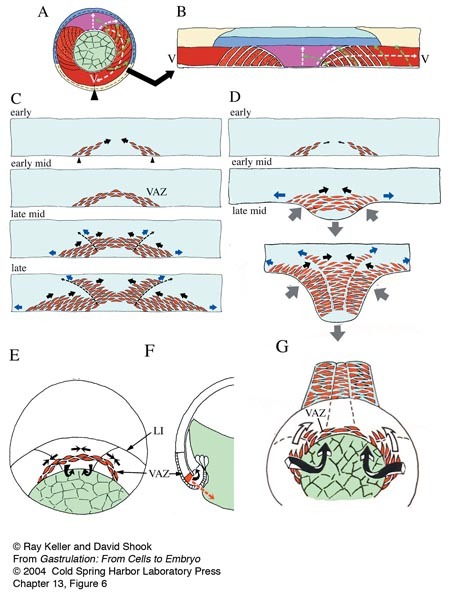 Patterns of cell motility, cell interactions, and mechanisms during convergent extension in Xenopus. 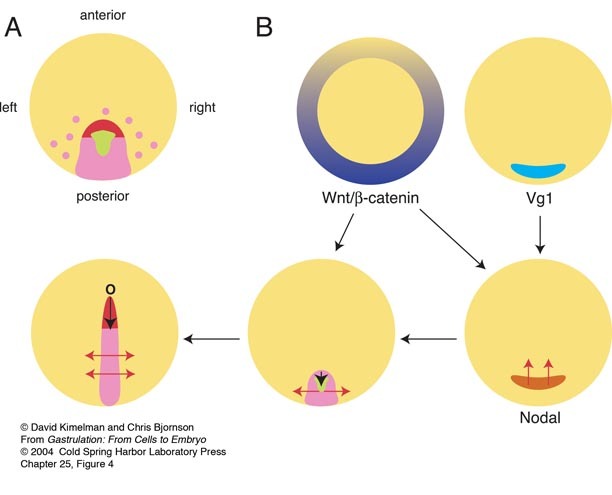 In Cell-cell interactions in early development (49th Symposium of the Society for Developmental Biology) (ed. G.C. Gerhart), pp. 31-62. Wiley-Liss, New York. 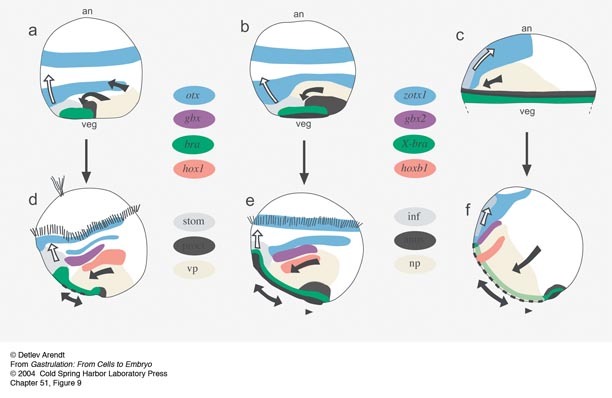 Xenopus laevis Keller Sandwich: (9 hours elapsed, 45 minutes/second): Vegetal is down, animal is up; explant starts at about stage 10. 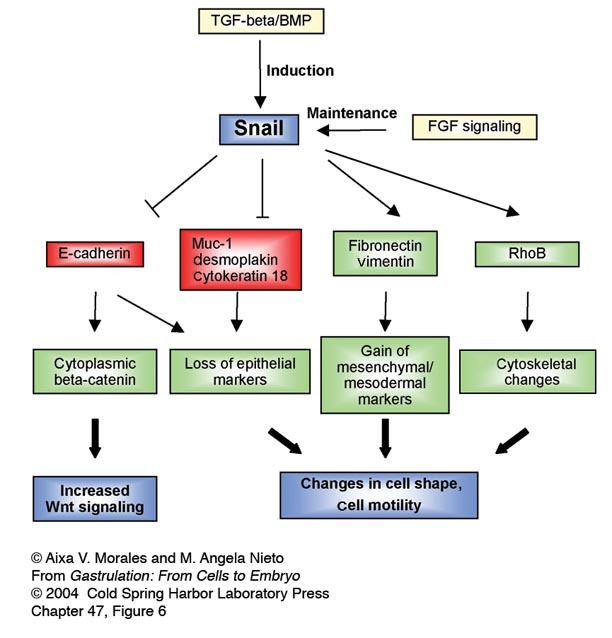 Refer to figure 3 in Gastrulation in Amphibians chapter. 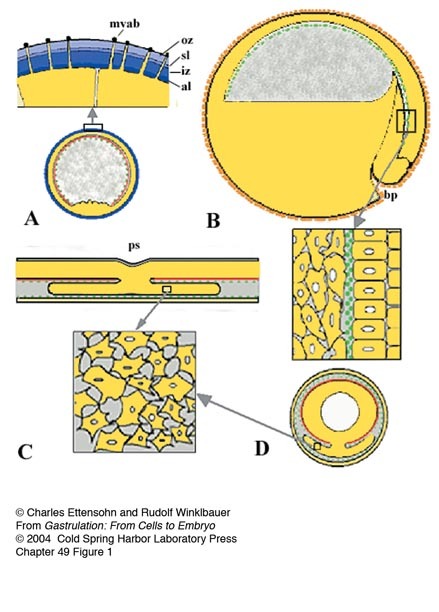 "Sandwich" explants were made of the “dorsal lip” tissue, immediately above the initial blastopore shown in the preceding movie, consisting of both the endodermal/mesodermal and neural tissue. 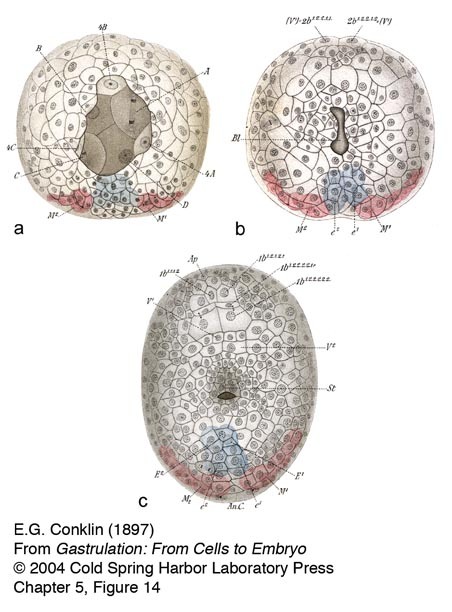 These regions of two embryos are cut out with eyebrow hair knives and sandwiched with their inner, deep surfaces together; these explants here were made of the dorsal 120 degree sector of the gastrula; larger explants consisting of the entire 360 degrees can also be made (giant explants). 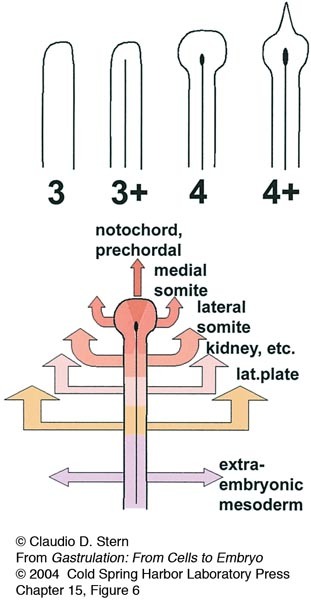 The mesodermal/endodermal regions and posterior neural regions converge, extend, and differentiate into notochord and somitic mesoderm and posterior neural tissue, respectively. 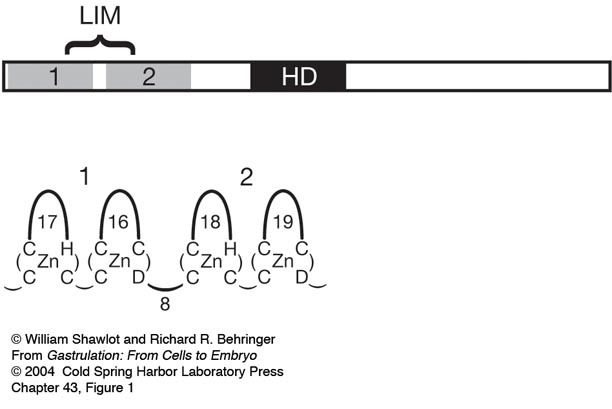 The explant will do these movements when cultured on agarose, unattached to the substrate. 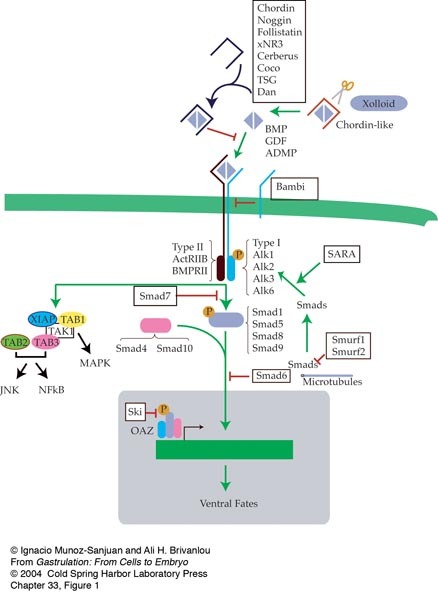 In fact, adhesion to the substrate retards these movements. 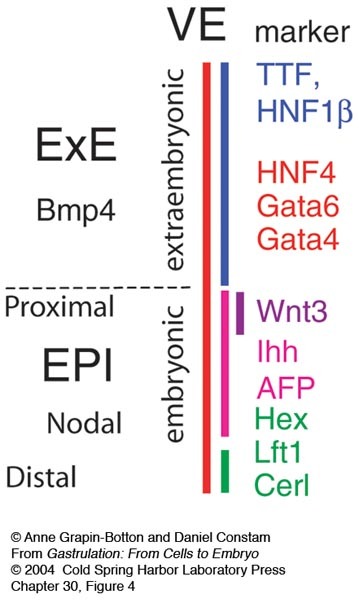 Xenopus laevis Open faced explant: Mediolateral Cell Intercalation Under Epi-illumination. 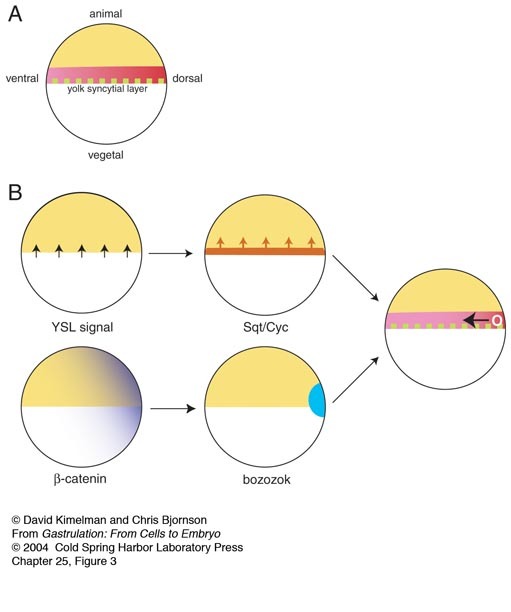 Deep mesodermal cells are intercalating mediolaterally and thus producing convergence along the horizontal axis of the frame, and extension along the vertical axis. The explant is anchored at its posterior end (off the screen at the top), and thus extends toward the bottom of the screen. Credit: Ray Keller and John Shih. Xenopus laevis Open faced explant: (40 minutes elapsed) A timelapse confocal movie of two fluorescently labeled cells shows the characteristic mediolateral elongation and polarized protrusive activity of intercalating deep mesodermal cells. 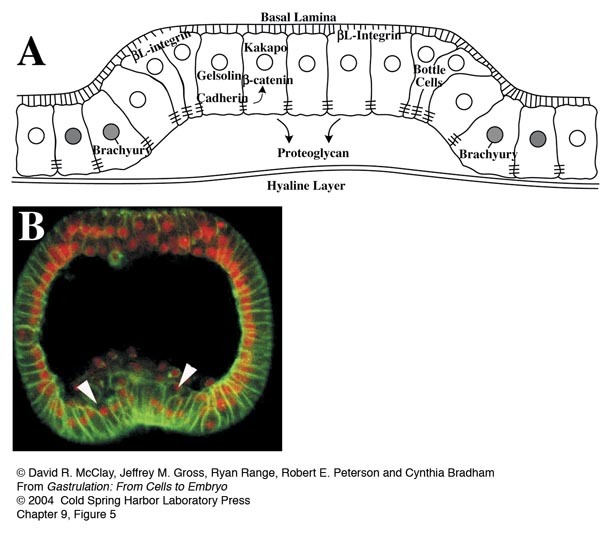 Xenopus laevis marginal zone explant: (50 minutes elapsed) Two color confocal of intercalation showing deep and superficial aspects of protrusive activity. 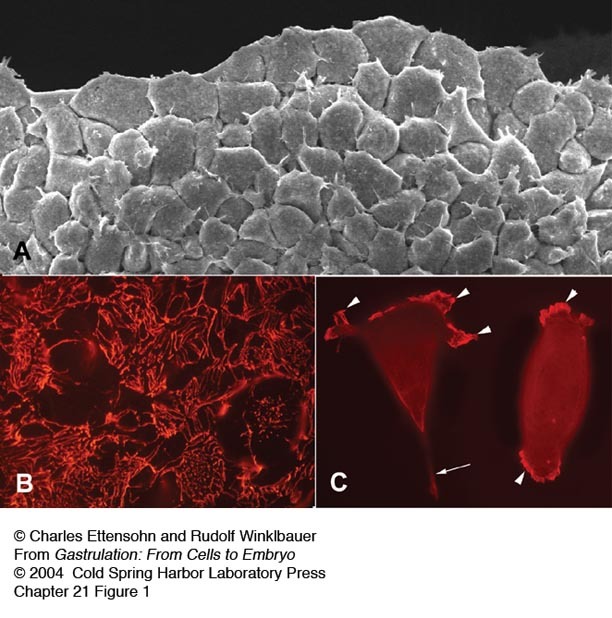 A two-plane confocal movie of intercalating deep mesodermal cells in an explant cultured on a fibronectin substrate shows the characteristic bipolar protrusive activity of these cells. The red plane is at the level of the substrate and the green plane is 5 microns deep. 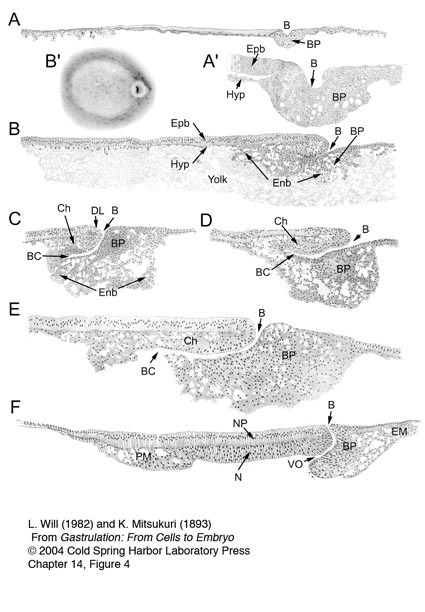 Xenopus laevis shaved open faced explant: (15 hours elapsed) A timelapse movie of deep mesodermal cells in the region of the future notochordal-somitic mesodermal boundary shows formation of this boundary and progression of the cell behaviors posteriorly along the boundary, and medially from the boundary. 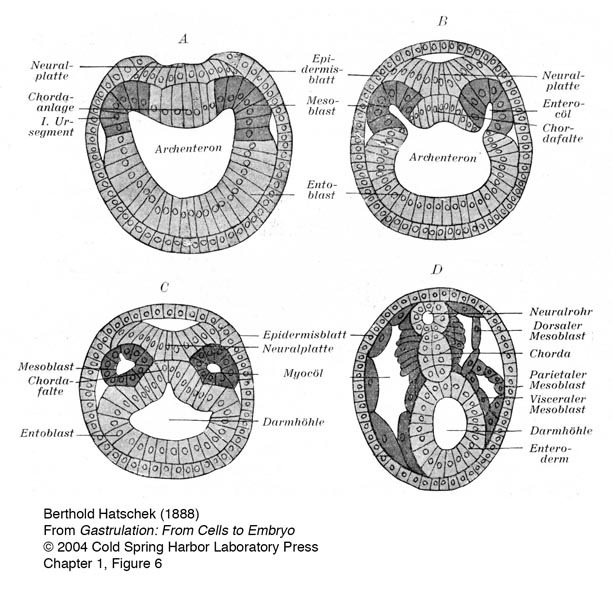 The notochord forms on the right and the somitic mesoderm on the left. 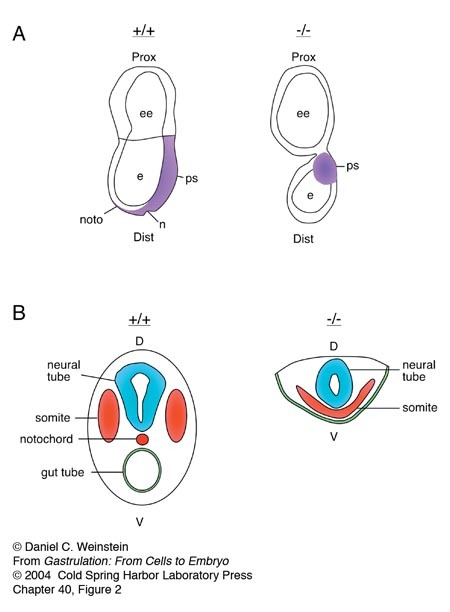 Note that the cells are intercalating in the region of future boundary formation and that a tongue of notochordal cells are pulled out of the somitic region as the boundary forms. Xenopus laevis "windowed" whole embryo: (90 minutes elapsed) A timelapse confocal movie of fluorescently labeled cells shows the spread, blunt ends of the notochordal cells facing the notochordal-somitic mesodermal boundary (notochord on upper left side and presumptive somitic mesoderm at the lower right side of the boundary). 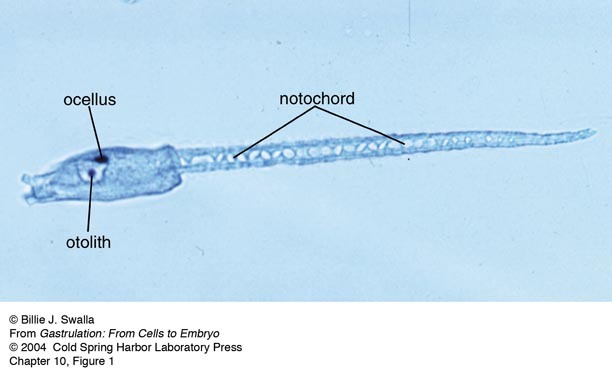 Note that the flattened boundary ends of the notochordal cells send small filiform protrusions across the boundary but do not cross it. 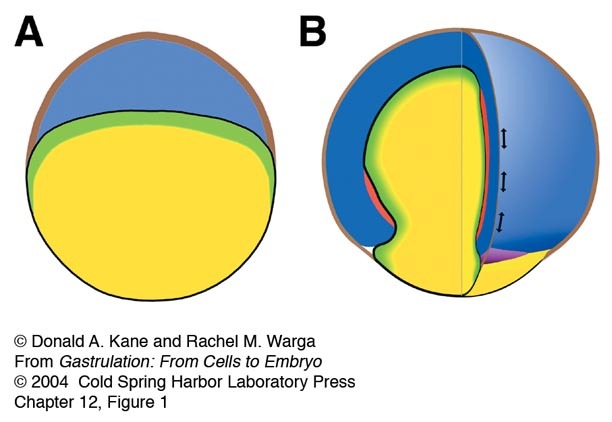 The "windowed" whole embryo involves removing a rectangular pane of neural ectoderm from the posterior end of a mid-gastrula stage embryo and culturing the embryo, window down, on fibronectin-coated glass. 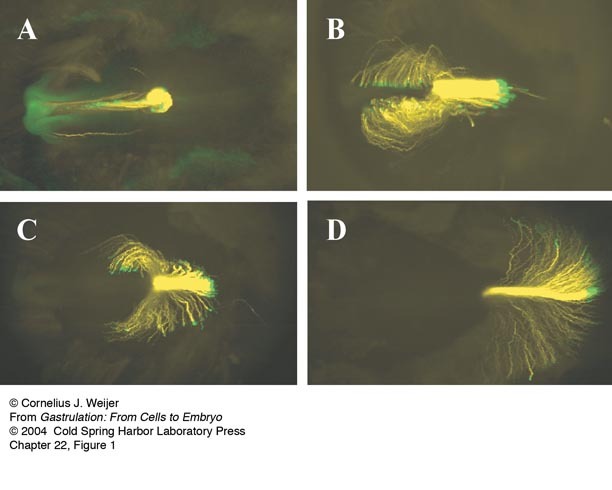 Xenopus laevis marginal zone explant: (60 minutes elapsed) A two-plane, timelapse confocal movie shows migration of mesendodermal cells on a fibronectin substrate in culture. 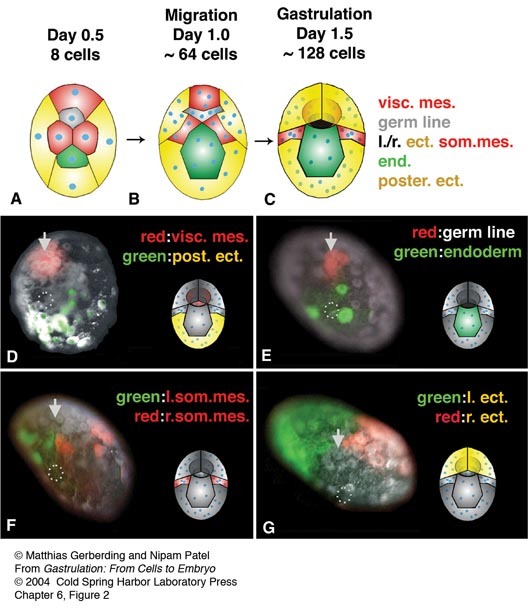 The red plane is at the level of the substrate and the green plane is 5 microns deep into the tissue. 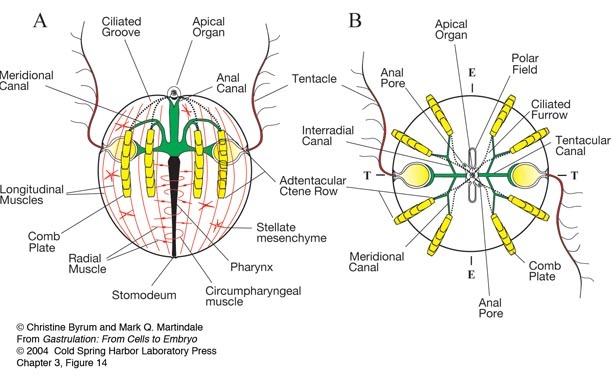 Note that the posterior cells (top of image) underlap the more anterior ones from behind. 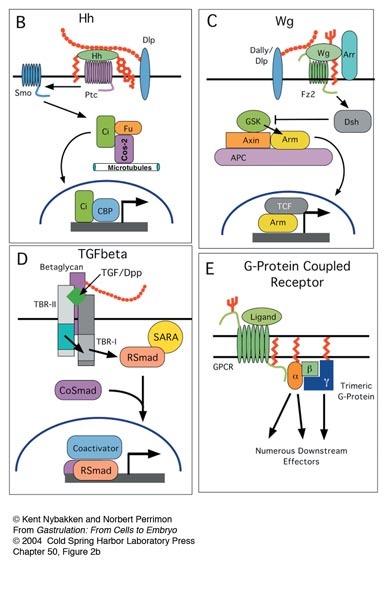 The cells are labeled with a plasma membrane targeted GFP. 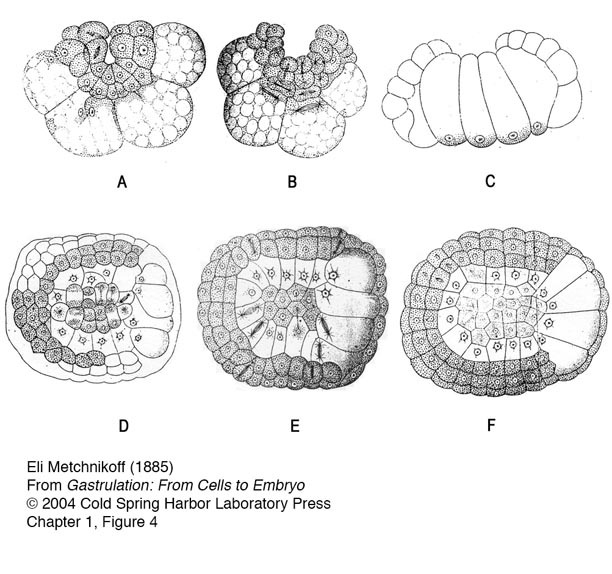 Ambystoma mexicanum Vegetal Gastrulation: (18.7 hours elapsed, 90 minutes/second) View from vegetal pole, dorsal is up. 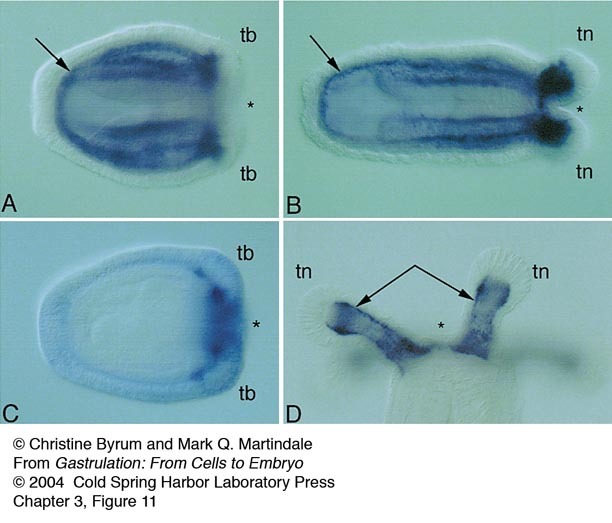 A timelapse recording of the vegetal region of the Ambystoma gastrula shows formation of the bottle cells and initial invagination and the subsequent involution of the involuting marginal zone. 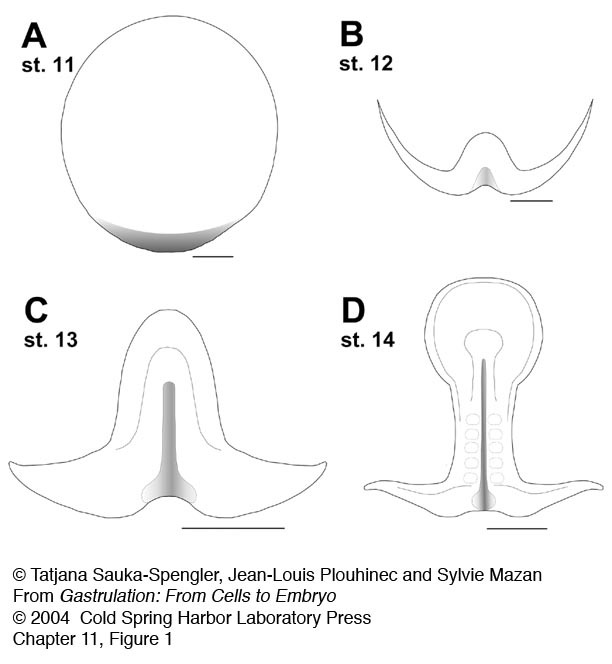 Ingression of the superficial cells of the involuting marginal zone occurs at its vegetal edge in the blastoporal groove, but is best seen in movies of explants (Movie13_14). Ambystoma maculatum Blastoporal Subduction, Low Resolution: (9.5 hours elapsed, 60 minutes/sec) Movie starts about stage 12.5. 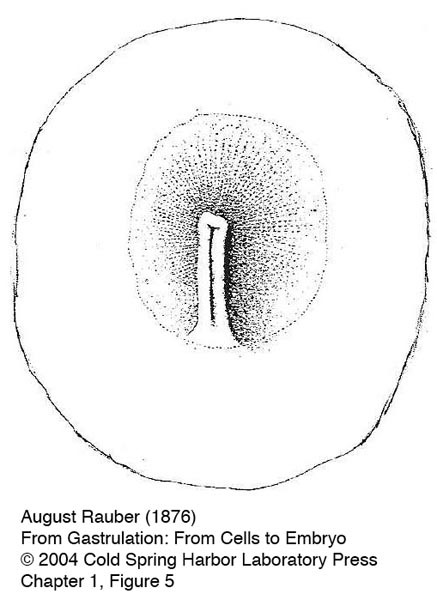 View looking at the roof of the gastrocoel, anterior to the left, blastopore is on the right, dorsal is horizontal center. 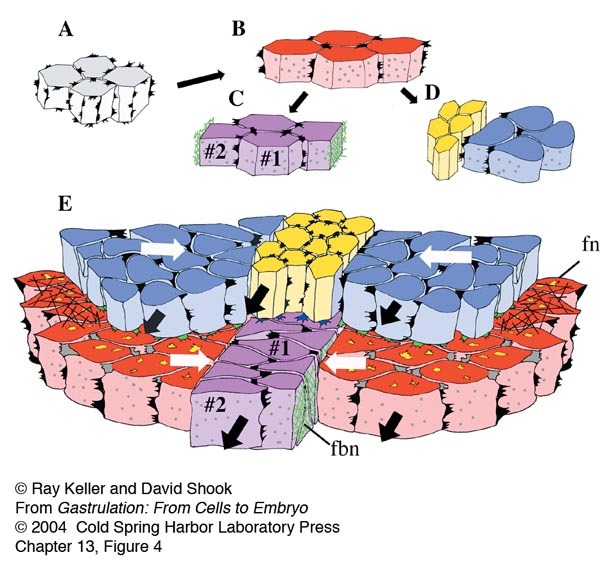 Cells are rolling around the blastopore from outside to in, apically constricting and subducting. 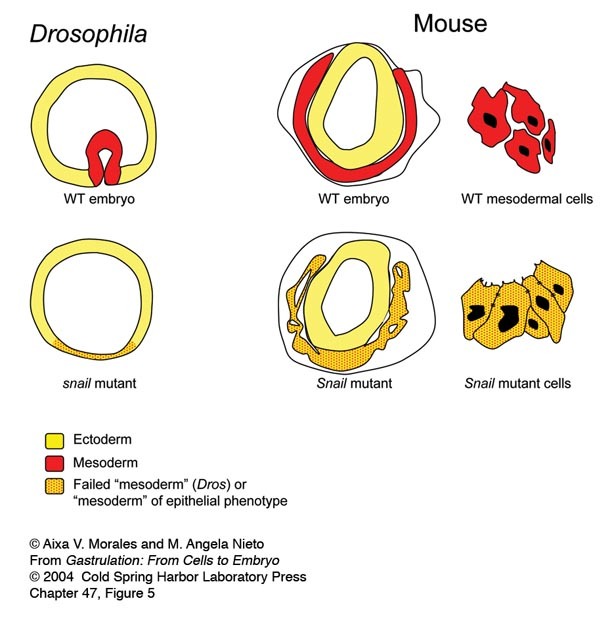 Refer to figure 11 in Gastrulation in Amphibians chapter. 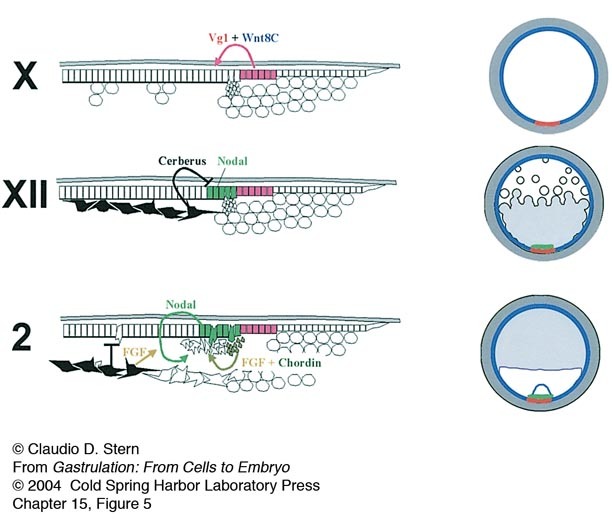 Credit: David Shook; Figure from Shook D. R., Majer C., and Keller R. (2002). 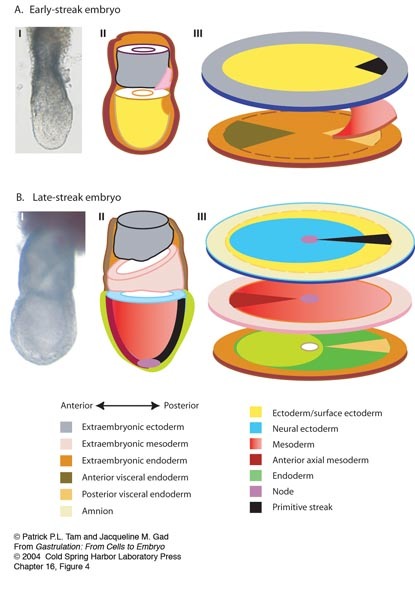 Urodeles remove mesoderm from the superficial layer by subduction through a bilateral primitive streak. Dev. Biol. 248, 220-239, included here with permission. Ambystoma mexicanum Giant Sandwich: (24 hours elapsed time; 8 fps; 80 minutes/second) Vegetal edge is down, dorsal is at vertical center, ventral is at either side. Movie begins at about stage 10+. 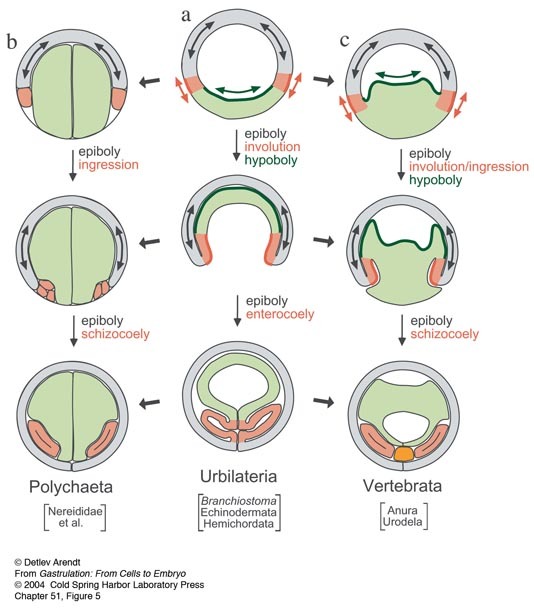 The animal portion of the explant expands (epiboly) while the vegetal edge contracts. 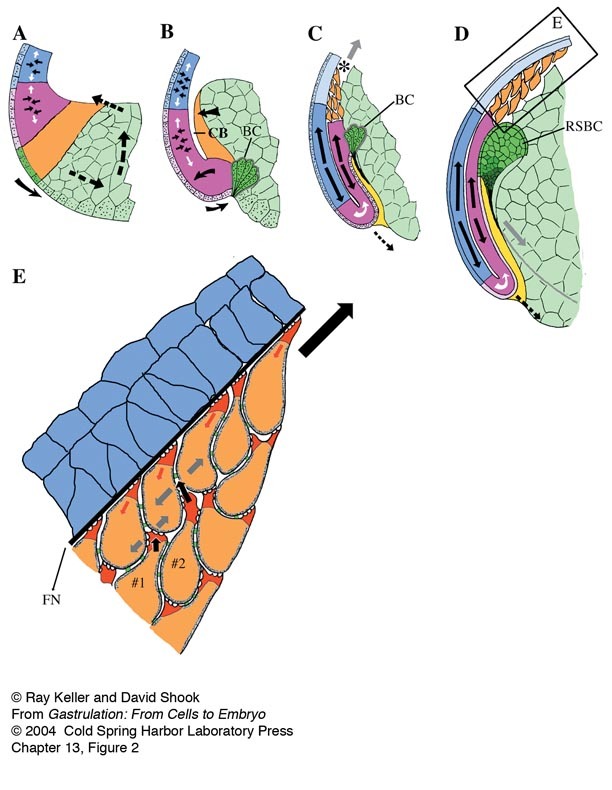 As the dorsal midline begins to extend, the dorsal blastoporal bottle cells un-constrict and apical constriction lateral of the endodermal field begins; subduction under the endodermal mounds follows, as does further dorsal extension and vegetal edge contraction. 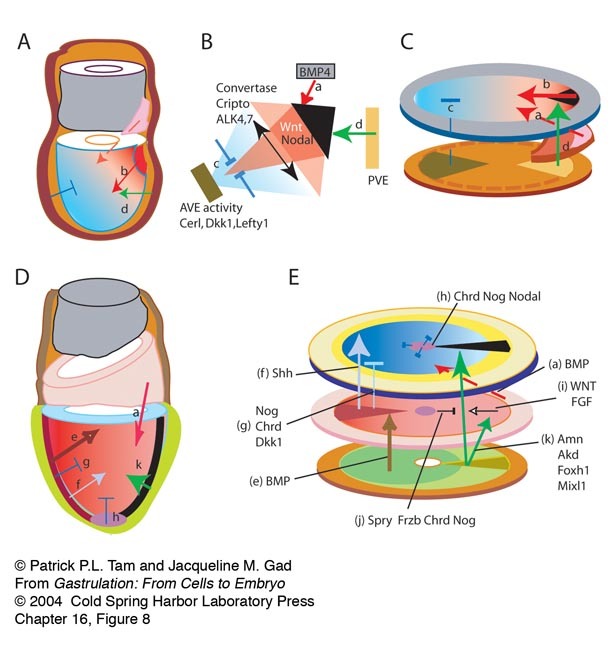 Loose cells leaving the surface of the explant at the end of the movie are artifactual. 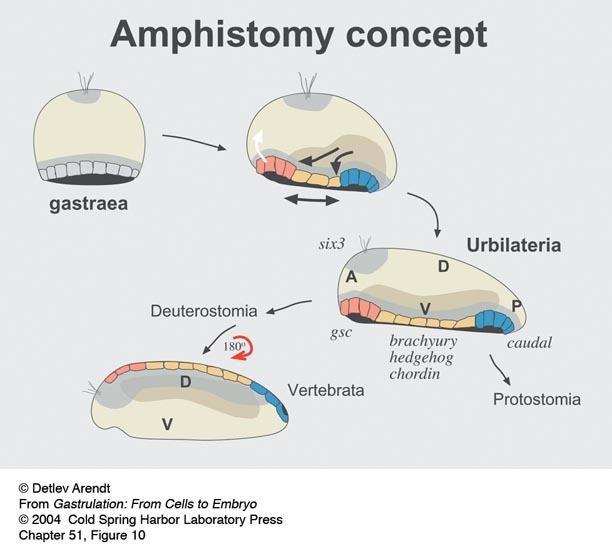 Refer to figure 12 in Gastrulation in Amphibians chapter. 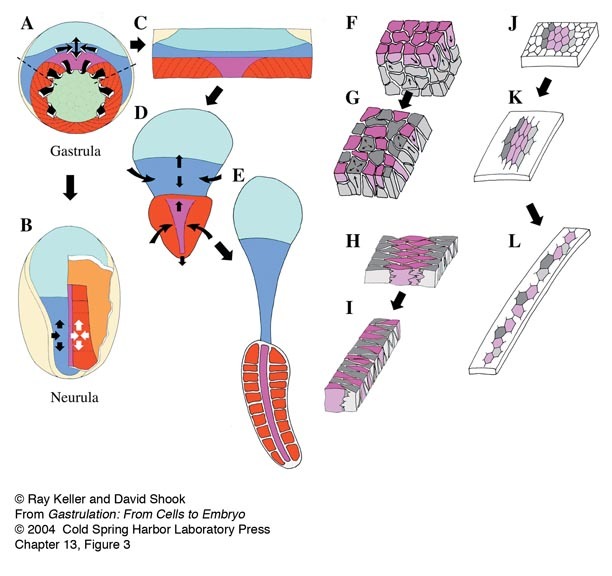 Credit: David Shook & Ray Keller; Figure from Shook D. R., Majer C., and Keller R. (2002). 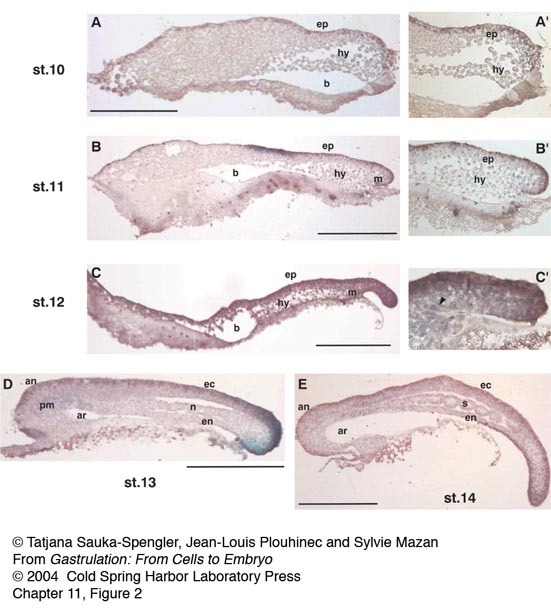 Urodeles remove mesoderm from the superficial layer by subduction through a bilateral primitive streak. Dev. Biol. 248, 220-239, included here with permission. Ambystoma maculatum Subduction, High Resolution: (5.25 hours elapsed, 30 minutes/second) Movie starts about stage 12.5. 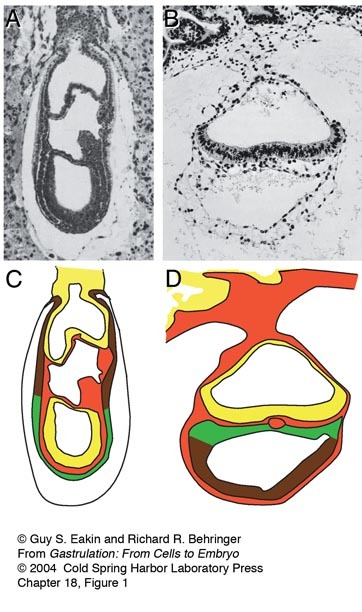 Region of subduction at blastopore; anterior right, dorsal down; out of focus cells at upper left are endoderm, in focus cells are presumptive mesoderm. 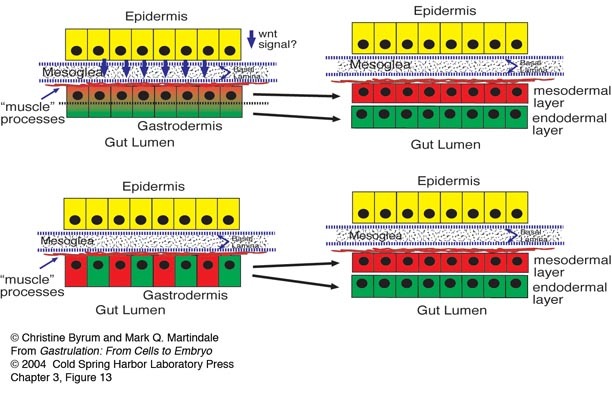 Mesodermal cells constrict their apices (to a greater or lesser degree), then subduct under the endoderm. 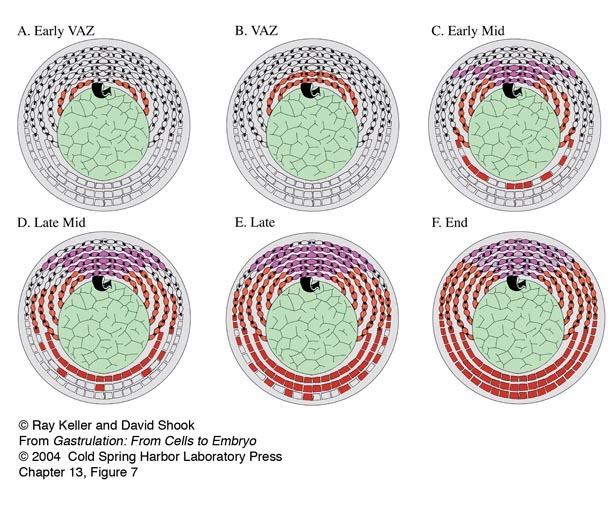 A high magnification timelapse movie shows apical constriction of the presumptive somitic mesodermal cells on the surface of the involuting marginal zone (small cells at lower right) and their subsequent subduction beneath the surface of the vegetal endoderm (large cells at the upper left). 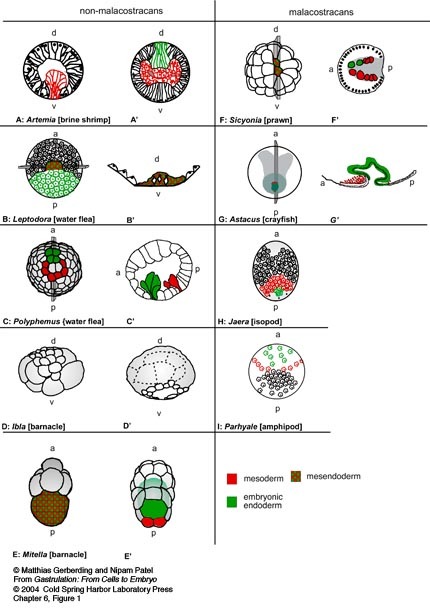 Refer to figure 12 in Gastrulation in Amphibians chapter. Ambystoma mexicanum Lateral Marginal Zone Explant with scattered fluorescent label: (36.5 hours elapsed, 120 minutes/second) Vegetal is lower left, animal is upper right. 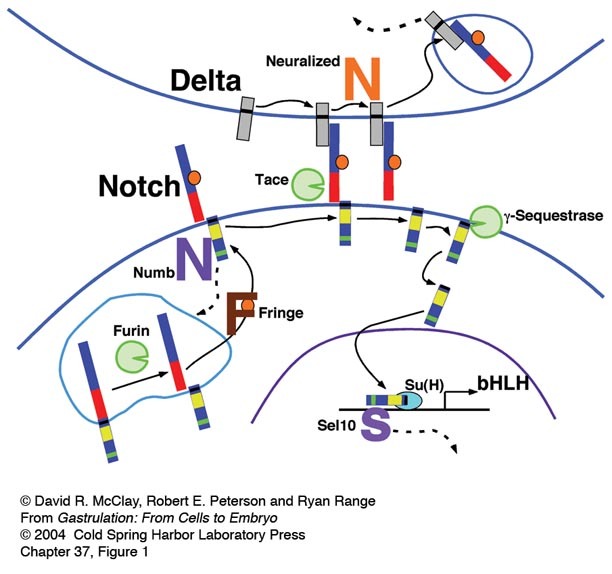 Single cells were injected with fluorescent dextran at the 128 cell stage; movie begins at approx. stage 11.5. 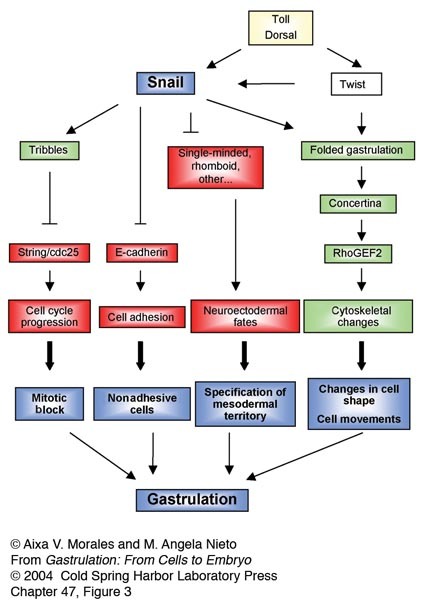 Refer to figure 12 in Gastrulation in Amphibians chapter. 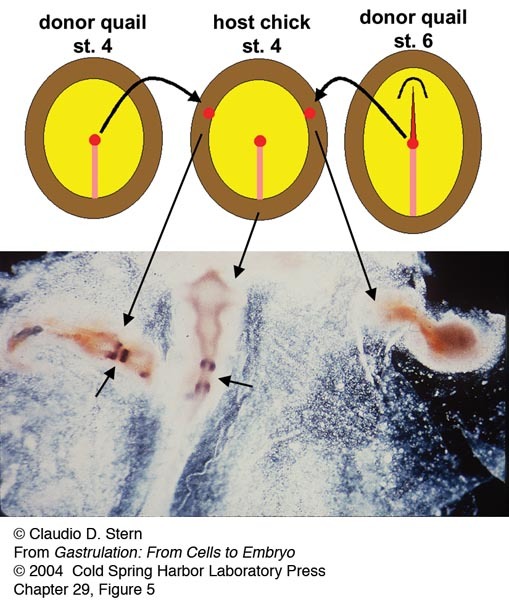 A high magnification timelapse movie of fluorescently labeled cells shows the initial epithelial state of the superficial mesodermal cells of the Ambystoma gastrula (right side), and their subsequent apical constriction, de-epithelialization and ingression to form mesenchymal cells (left side). Ambystoma mexicanum Lateral Marginal Zone explant: (26.5 hours elapsed, 6 mintues/frame until end, then 4 minute/frame during last, highest magnification view; 120 minutes/second then 80 minutes/second) Vegetal end of explant is down, animal up. 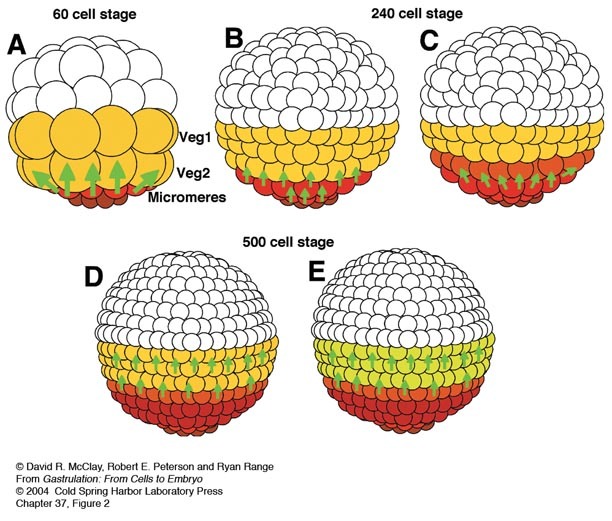 Cells begin constricting their apices near the vegetal edge but above the larger endodermal cells; de-epithelialization follows; Shown at sequentially higher magnifications. 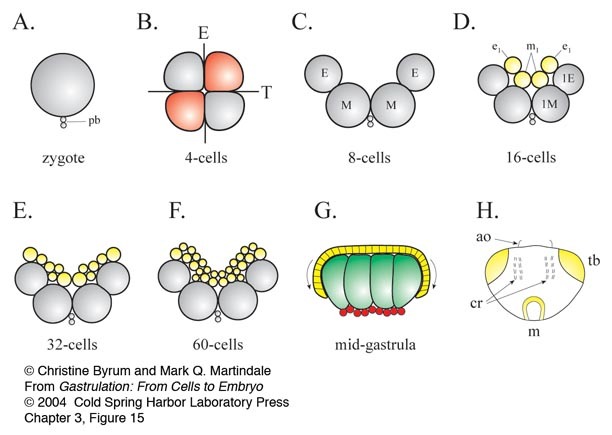 Refer to figure 11 in Gastrulation in Amphibians chapter. 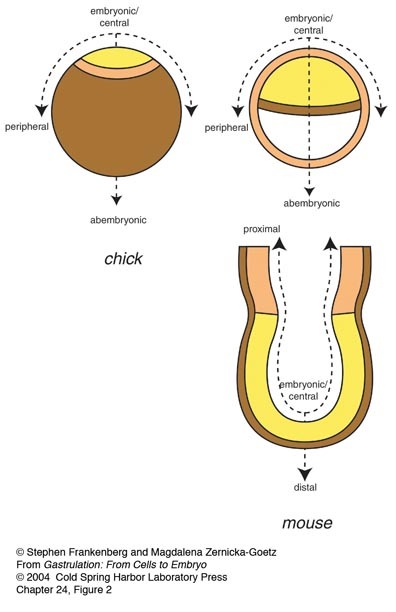 Time-lapse movie of a chick embryo developing from stage XII/XIII to stage 3+ (when the middle layer starts to emerge from the primitive streak). 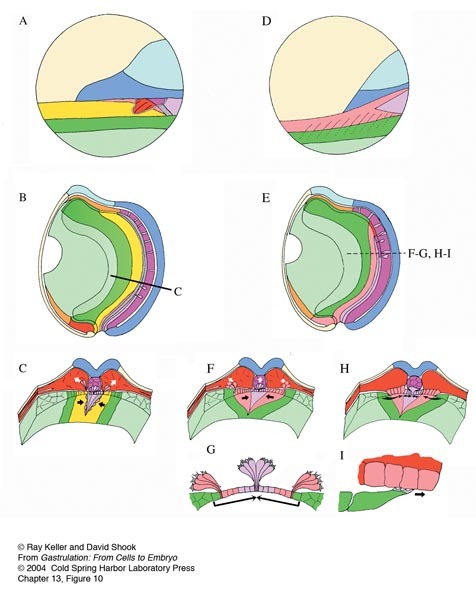 The posterior edge of the blastodisc lies towards the left. 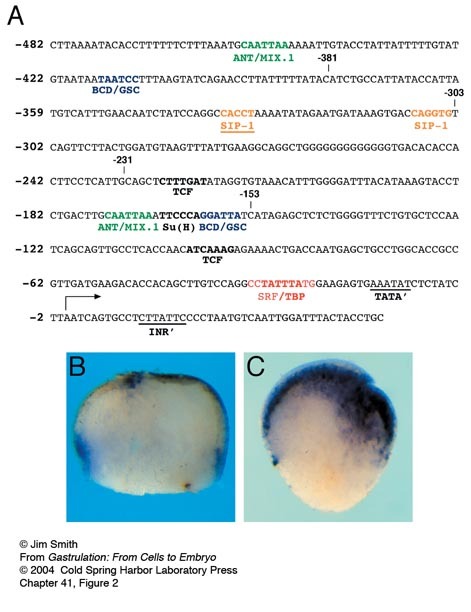 Sequence acquired by Dr Cheng Cui in Professor C.J. 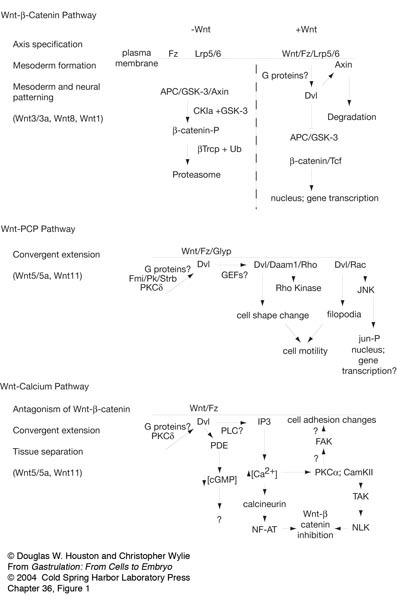 Weijer’s laboratory, included here with kind permission of these colleagues. 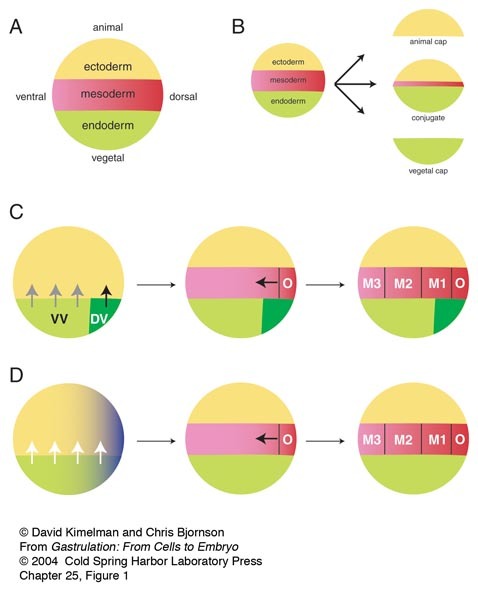 A cartoon animation of the movements of chick gastrulation as we currently envisage them, concentrating on the movements of the lower layer (hypoblast and endoblast) and mesendoderm. 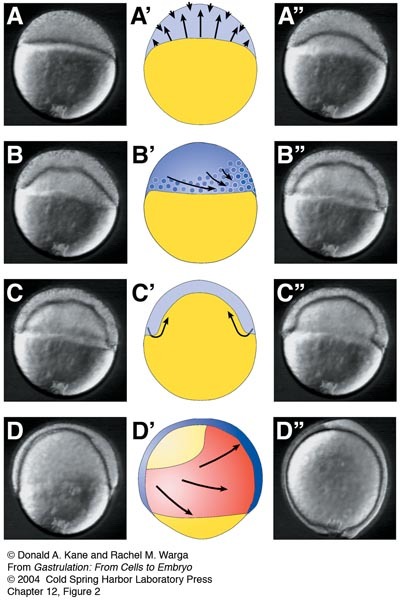 Time-lapse movie of a chick embryo starting at stage XII/XIII, in which a small group of cells in the prospective forebrain territory has been labelled with DiI. 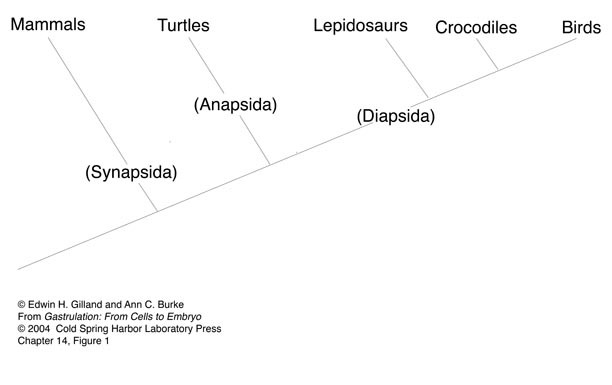 The posterior edge of the blastodisc lies towards the top right. 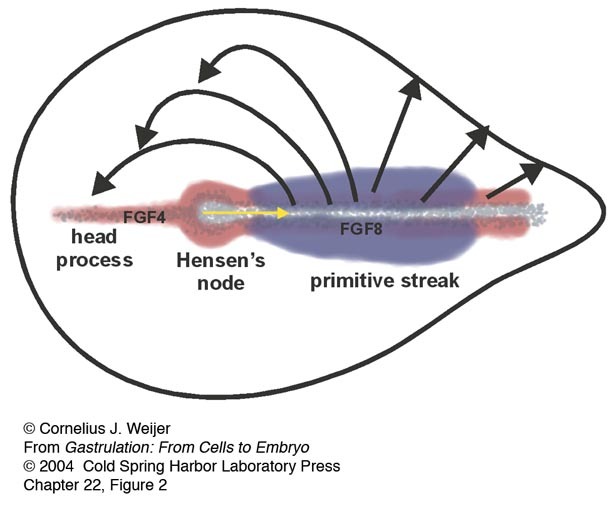 Note the Polonaise movements which begin before primitive streak formation. 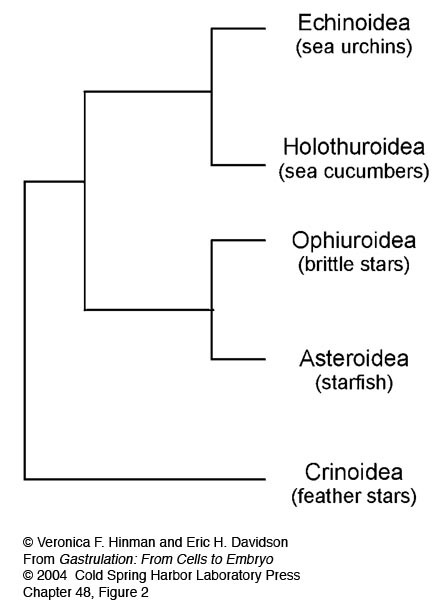 From Foley A.C., Skromne I.S., and Stern C.D. 2000. 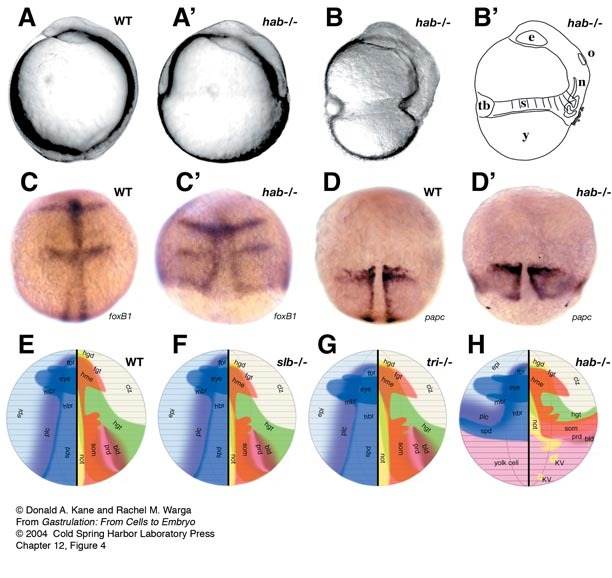 Reconciling different models of forebrain induction and patterning: A dual role for the hypoblast. Development 127: 3839-3854. 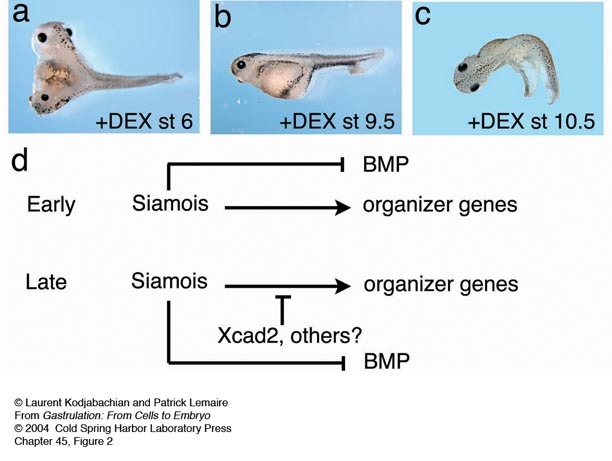 Used here with permission from the Company of Biologists Ltd.
Time-lapse movie of a developing 5.5 dpc mouse embryo, showing the migration of Anterior Visceral Endoderm (AVE) cells. 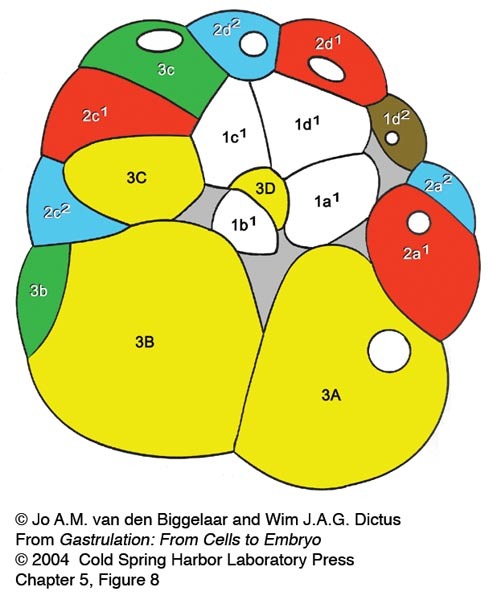 The embryo is oriented with the anterior facing the viewer. 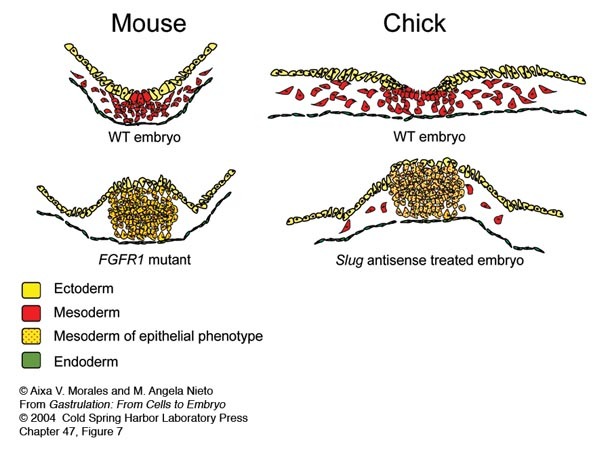 AVE cells can be distinguished by the expression of EGFP. 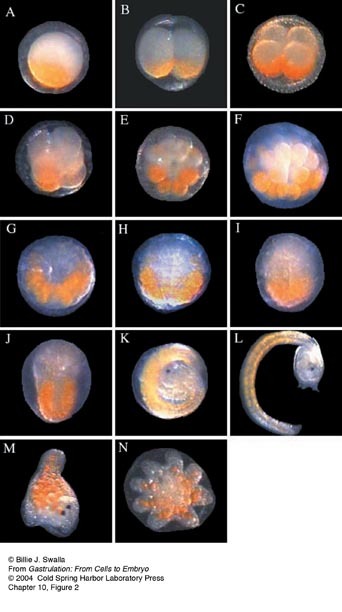 The embryo was imaged every 12 minutes with phase contrast and fluorescence optics. 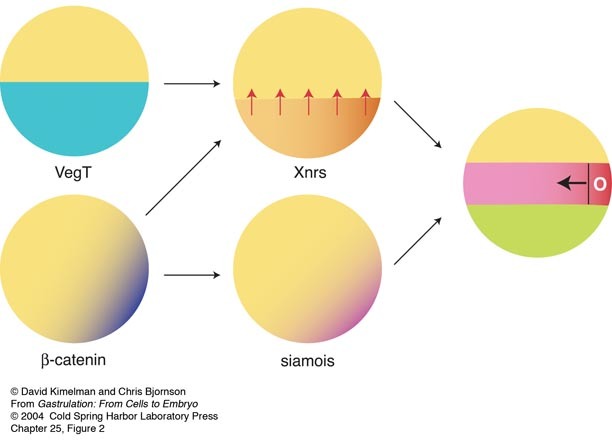 The time from the start of imaging is indicated in hours and minutes at the bottom right of each frame. 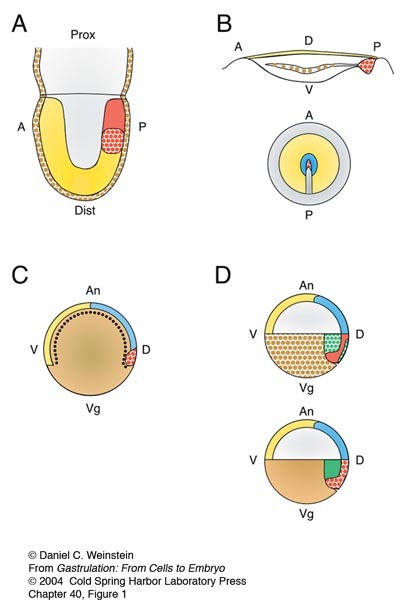 AVE cells generally traverse the approximately 100 microns from the distal tip of the egg cylinder to the prospective anterior in four to five hours. 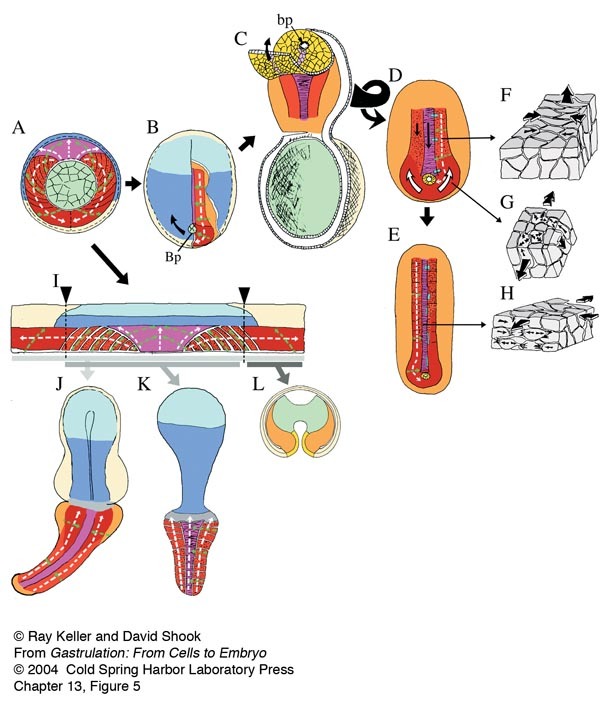 On reaching the junction of the epiblast and the extra-embryonic ectoderm, they come to an abrupt halt and instead start to spread laterally. 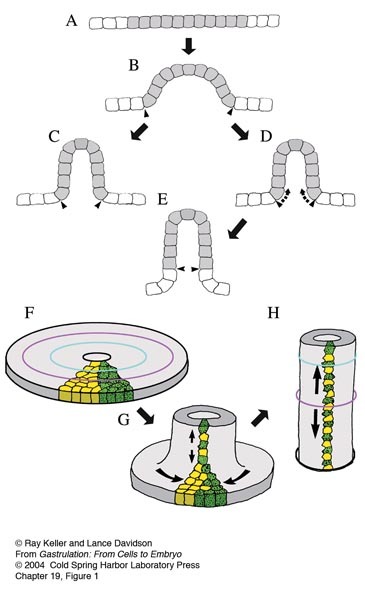 During their movement from the distal tip, AVE cells project filopodia primarily in the direction of motion, which is an indication that they are actively migrating, rather than being passively displaced. 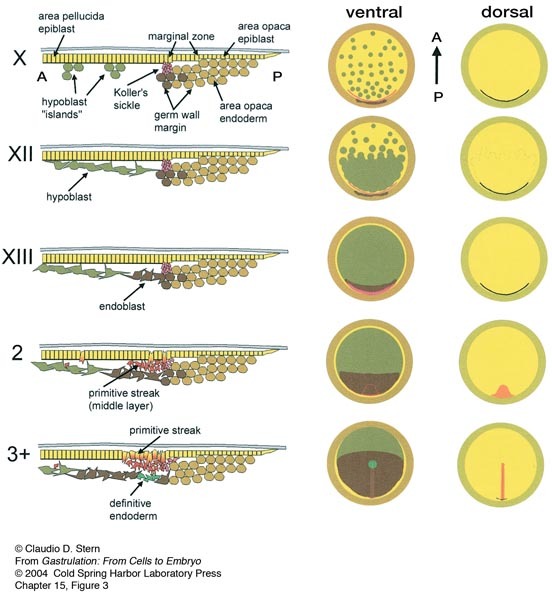 Sequence by Dr Shankar Srinivas, published in Development 131:1157-1164 (2004), reproduced with kind permission of Dr Srinivas and the Company of Biologists Ltd.
Lytechinus pictus Primary Invagination: (4 hours elapsed) Primary invagination occurs as the flat vegetal plate forms a pocket that then extends into the blastocoel forming the archenteron. 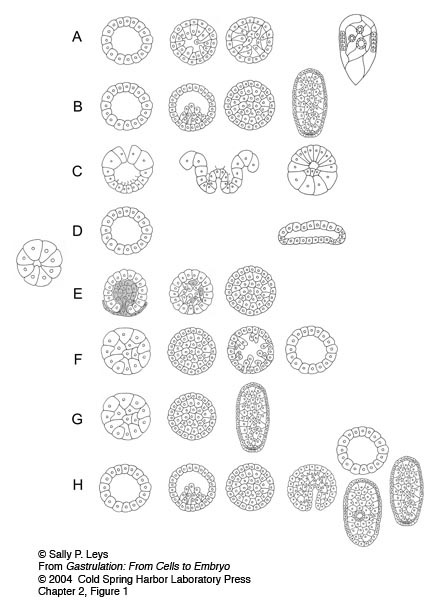 In this sequence the thickened vegetal plate is at the bottom. 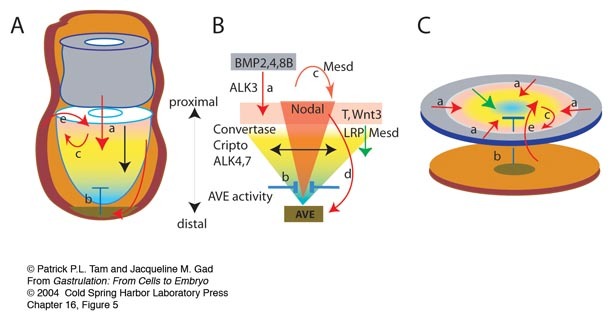 At the start of the timelapse, primary mesenchyme cells have already ingressed and lie on the basal surface of the vegetal plate. 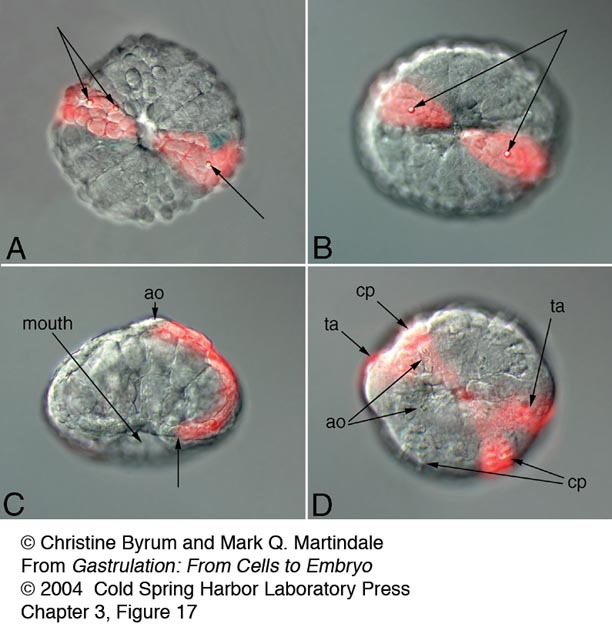 Embryo is trapped within a Calcium Carbonate encrusted nitex meshwork and the timelapse collected with DIC timelapse digital video microscopy. 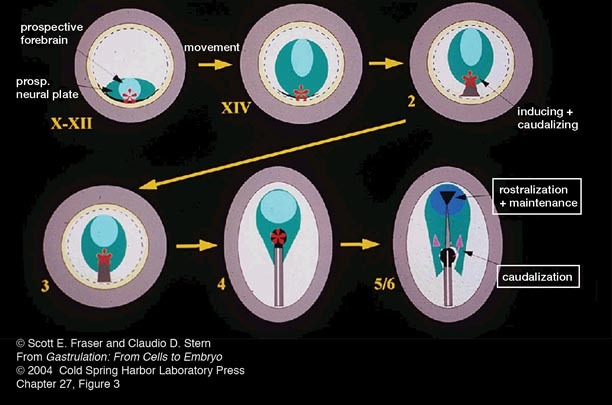 Xenopus laevis Vegetal View of Gastrulation & Neurulation: (15.0 hours elapsed, 48 minutes/second). 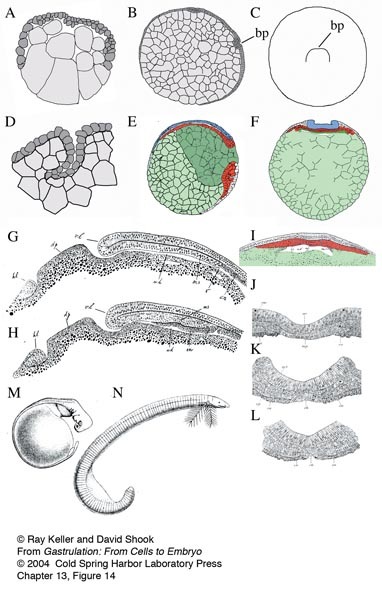 The movie shows gastrulation and neurulation viewed from the vegetal pole, the future dorsal side at the top. 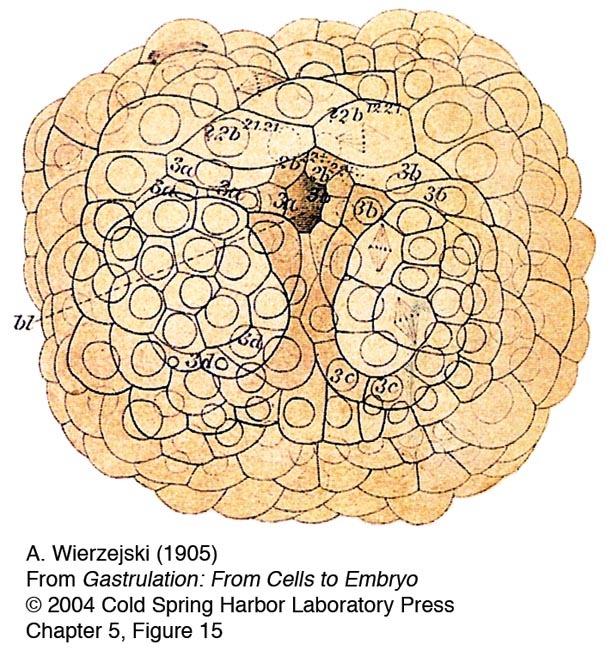 Note the dramatic involution of the IMZ, which forms an annulus or ring of cells surrounding the large central disc of vegetal endodermal cells at the center of the vegetal pole. 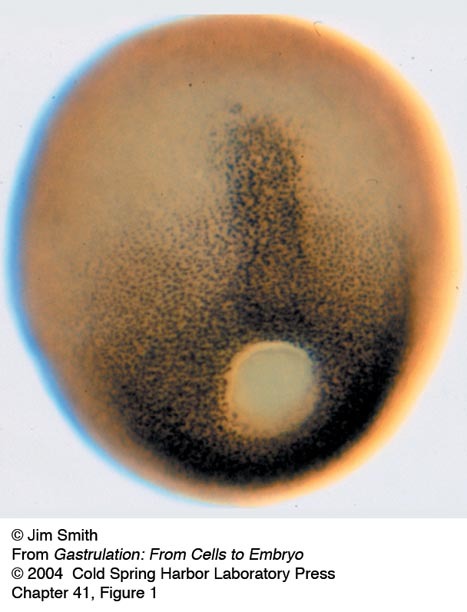 The bottle cells, marking the initiation of involution, have already formed mid-dorsally as indicated by the black pigment accumulation. 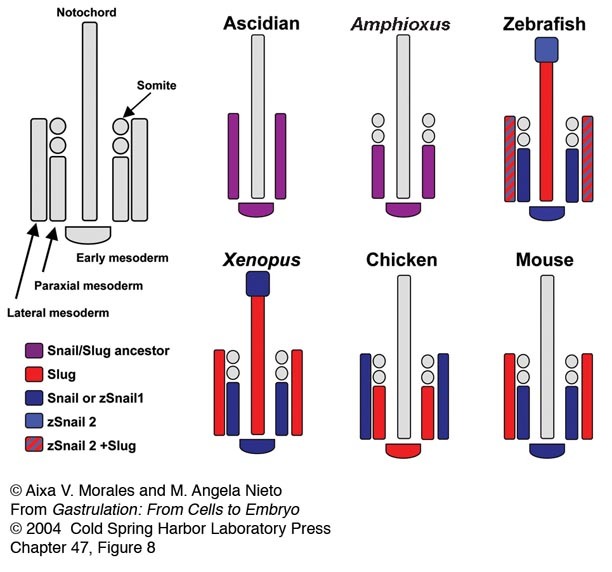 Note that the dorsal IMZ, region above these bottle cells rolls over the blastoporal lip and disappears inside; subsequently this involution proceeds laterally, on both sides, and finally at the midventral line. 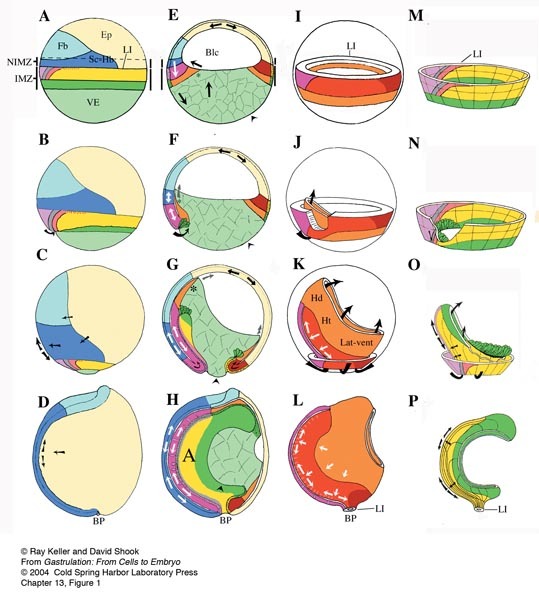 As the IMZ involutes, it also extends posteriorly and converges around the circumference of the blastopore, but does so inside, out of sight. 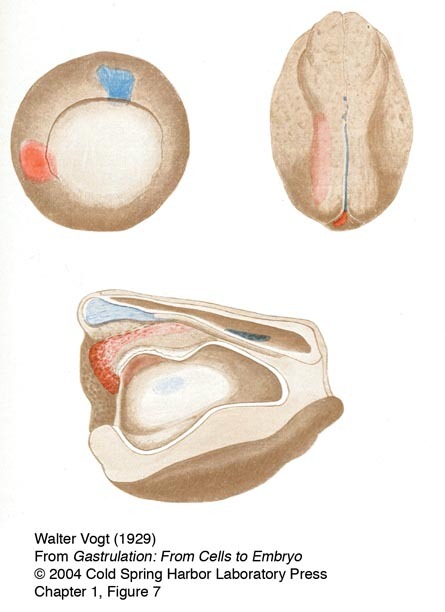 As it does so, note that the posterior neural tissue likewise converges and extends in the same fashion, on the outside; together these convergent extension movements squeeze the blastopore shut and simultaneously elongate the anterior-posterior axis of the embryo, pushing the future tail away from the head. 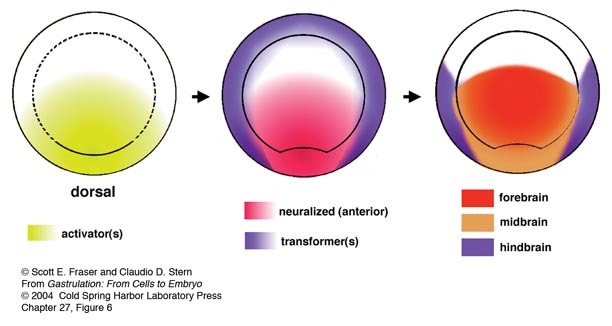 Note that the converging and extending neural plate simultaneously rolls up to form a neural tube. See Keller, R. 1975. 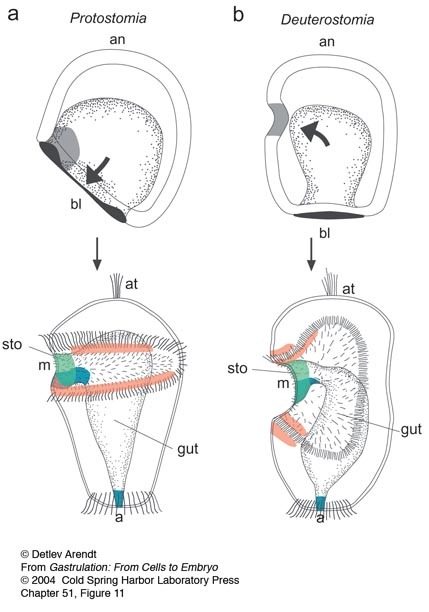 Vital dye mapping of the gastrula and neurula of Xenopus laevis. I. 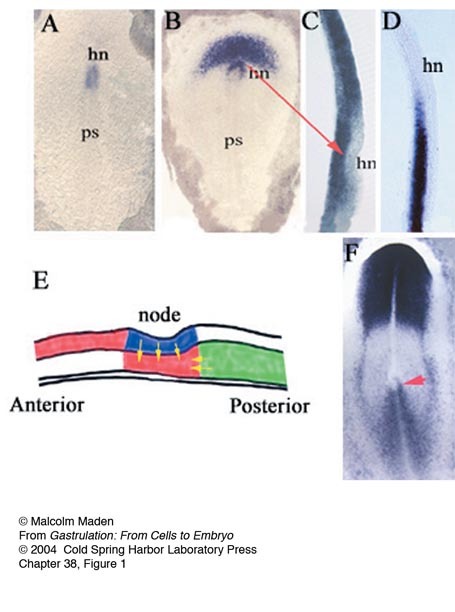 Prospective areas and morphogenetic movements of the superficial layer. Dev. 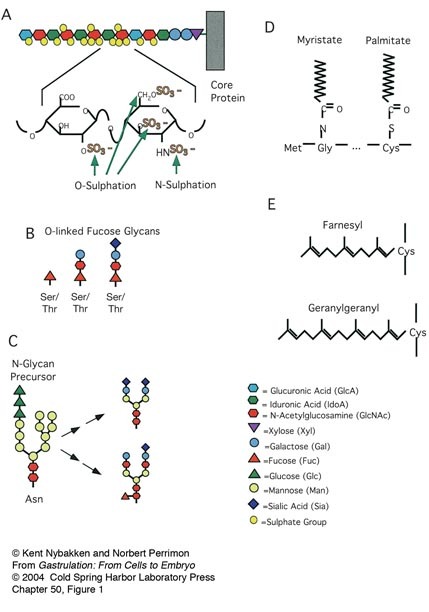 Biol. 42: 222-241; Keller, R. 1976. 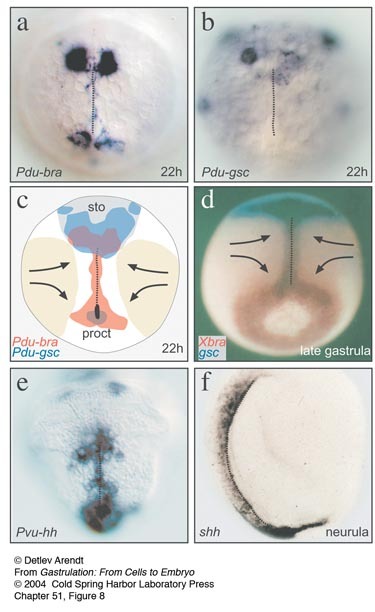 Vital dye mapping of the gastrula and neurula of Xenopus laevis. II. 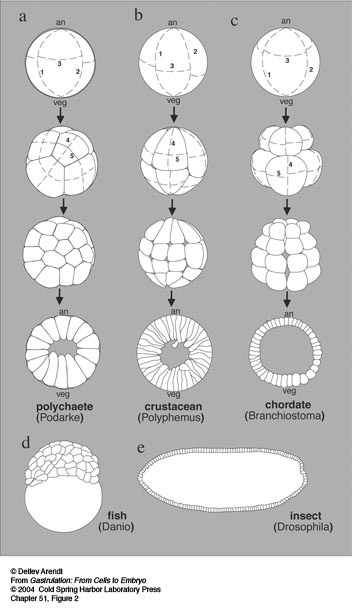 Prospective areas and morphogenetic movements of the deep layer. Dev. 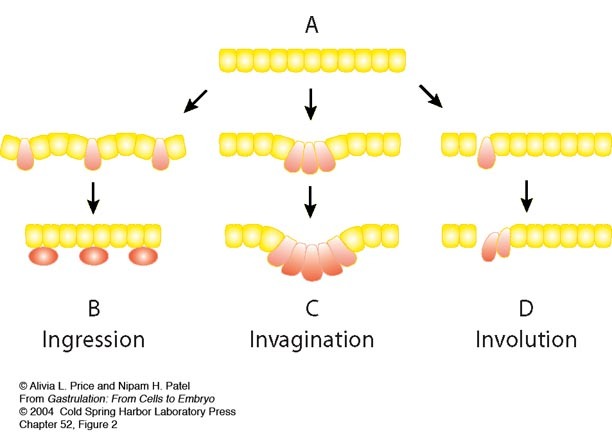 Biol. 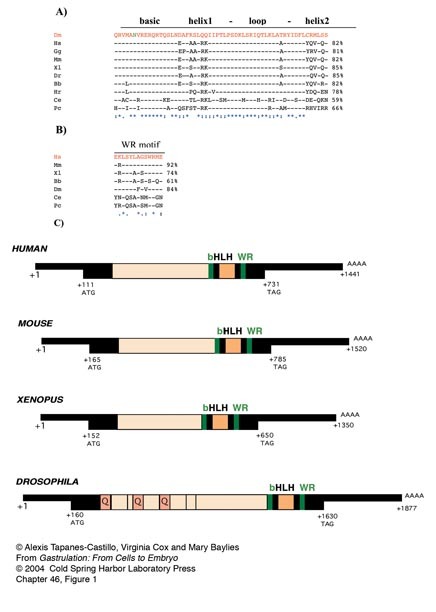 51: 118-137; Keller R., Shih J., Wilson P.A., and Sater A.K. 1991. 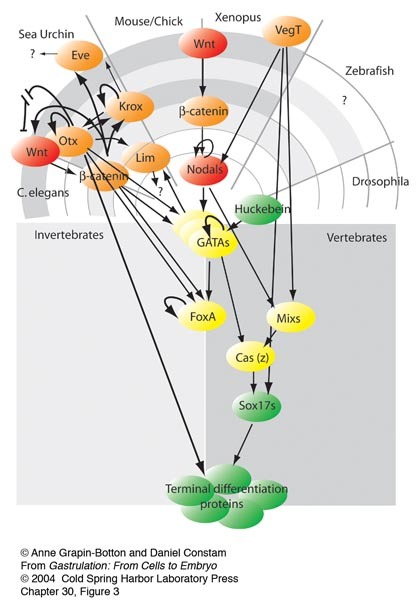 Patterns of cell motility, cell interactions, and mechanisms during convergent extension in Xenopus. 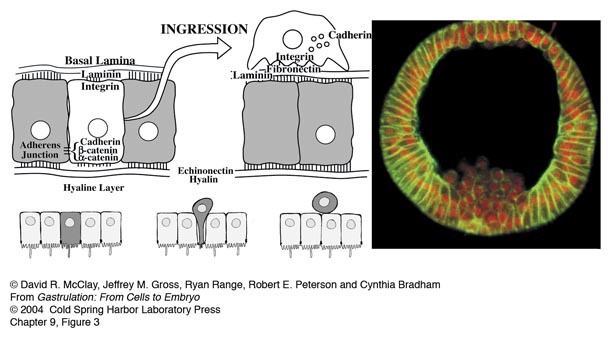 In Cell-cell interactions in early development (49th Symposium of the Society for Developmental Biology) (ed. G.C. Gerhart), pp. 31-62. Wiley-Liss, New York. 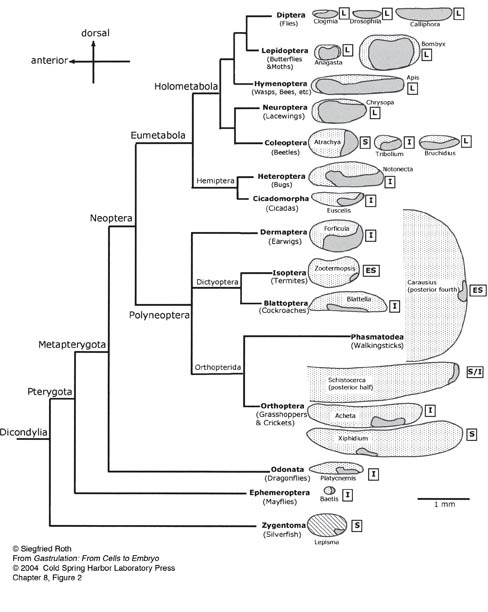 Xenopus laevis Keller Sandwich: (9 hours elapsed, 45 minutes/second): Vegetal is down, animal is up; explant starts at about stage 10. 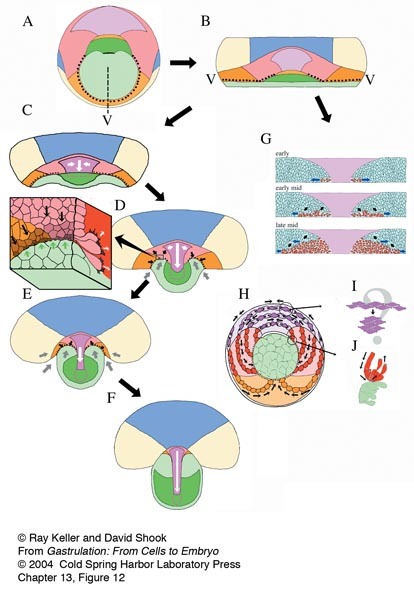 "Sandwich" explants were made of the “dorsal lip” tissue, immediately above the initial blastopore shown in the preceding movie, consisting of both the endodermal/mesodermal and neural tissue. 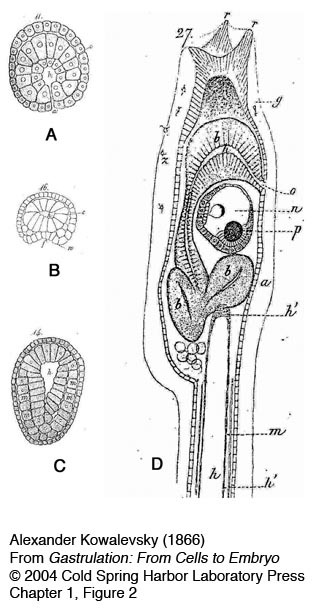 These regions of two embryos are cut out with eyebrow hair knives and sandwiched with their inner, deep surfaces together; these explants here were made of the dorsal 120 degree sector of the gastrula; larger explants consisting of the entire 360 degrees can also be made (giant explants). 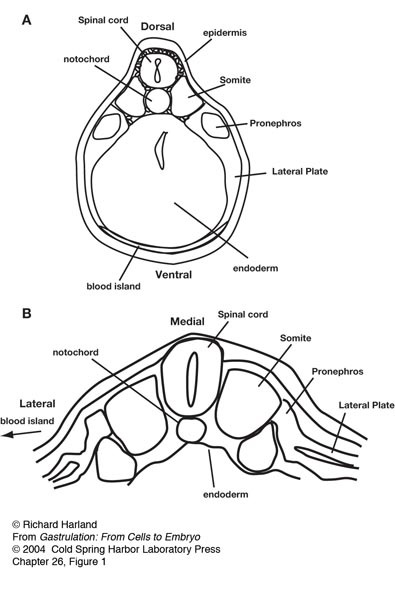 The mesodermal/endodermal regions and posterior neural regions converge, extend, and differentiate into notochord and somitic mesoderm and posterior neural tissue, respectively. 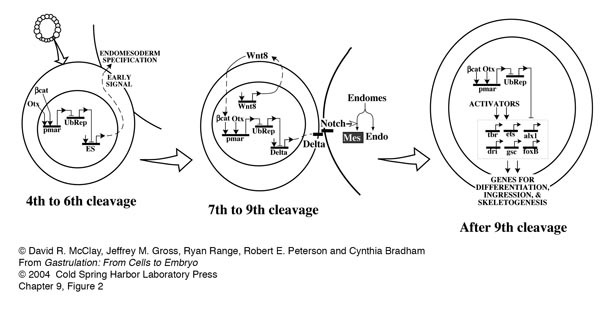 The explant will do these movements when cultured on agarose, unattached to the substrate. 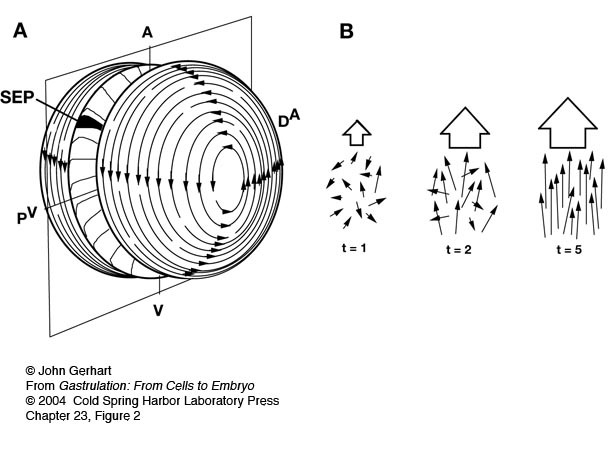 In fact, adhesion to the substrate retards these movements. 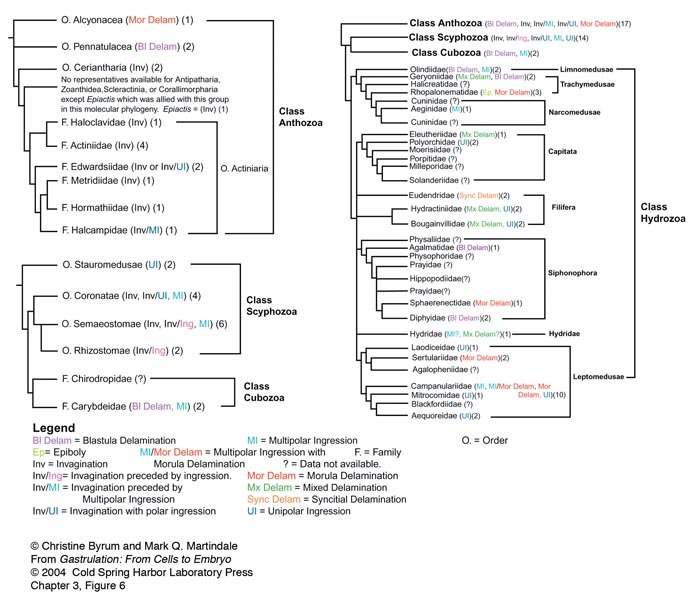 Ambystoma mexicanum Lateral Marginal Zone Explant with scattered fluorescent label: (36.5 hours elapsed, 120 minutes/second) Vegetal is lower left, animal is upper right. 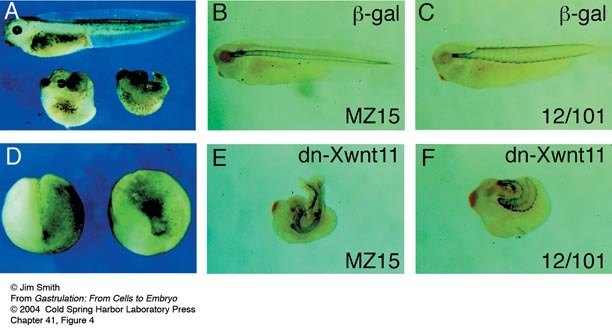 Single cells were injected with fluorescent dextran at the 128 cell stage; movie begins at approx. stage 11.5. 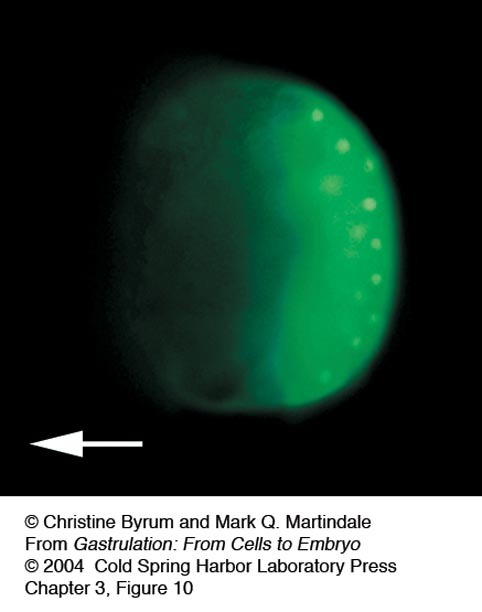 A high magnification timelapse movie of fluorescently labeled cells shows the initial epithelial state of the superficial mesodermal cells of the Ambystoma gastrula (right side), and their subsequent apical constriction, de-epithelialization and ingression to form mesenchymal cells (left side). Ambystoma maculatum Blastoporal Subduction, Low Resolution: (9.5 hours elapsed, 60 minutes/sec) Movie starts about stage 12.5. 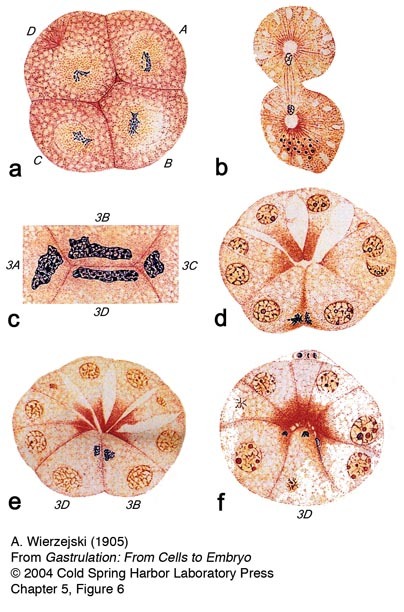 View looking at the roof of the gastrocoel, anterior to the left, blastopore is on the right, dorsal is horizontal center. 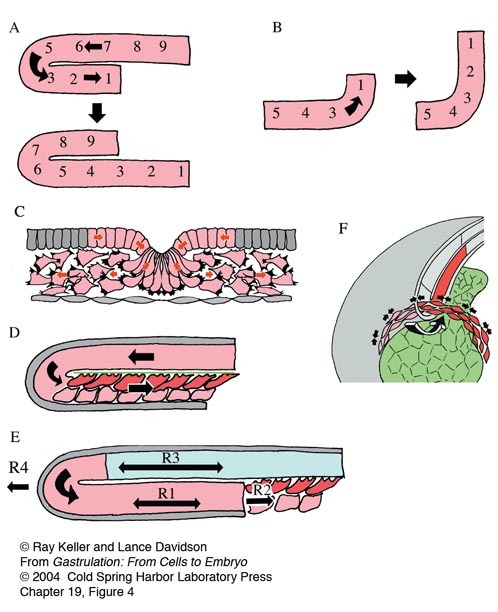 Cells are rolling around the blastopore from outside to in, apically constricting and subducting. Ambystoma maculatum Subduction, High Resolution: (5.25 hours elapsed, 30 minutes/second) Movie starts about stage 12.5. 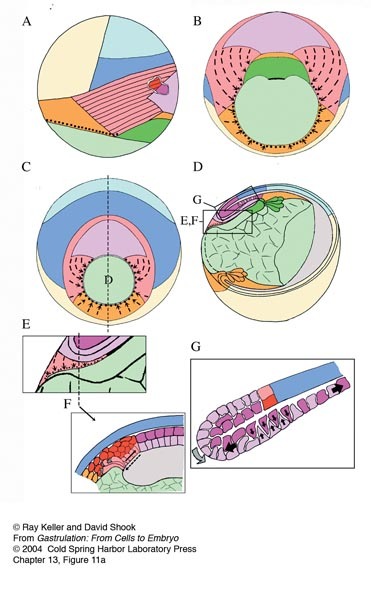 Region of subduction at blastopore; anterior right, dorsal down; out of focus cells at upper left are endoderm, in focus cells are presumptive mesoderm. 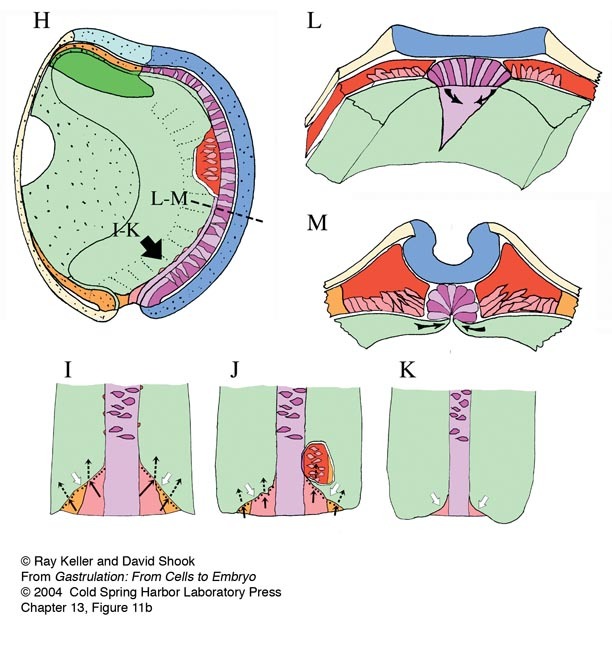 Mesodermal cells constrict their apices (to a greater or lesser degree), then subduct under the endoderm. 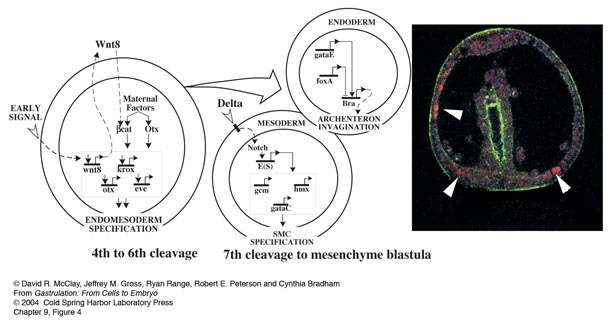 A high magnification timelapse movie shows apical constriction of the presumptive somitic mesodermal cells on the surface of the involuting marginal zone (small cells at lower right) and their subsequent subduction beneath the surface of the vegetal endoderm (large cells at the upper left). 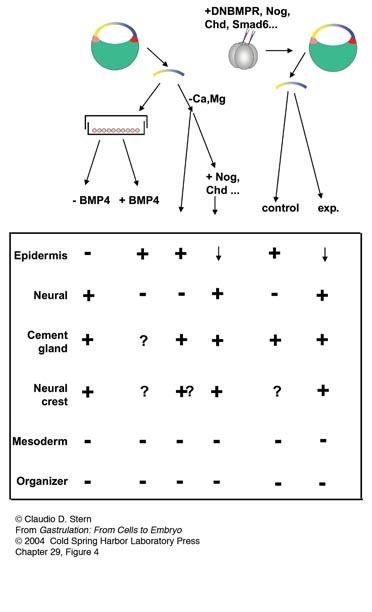 Dorsal mesodermal cells form the notochord. 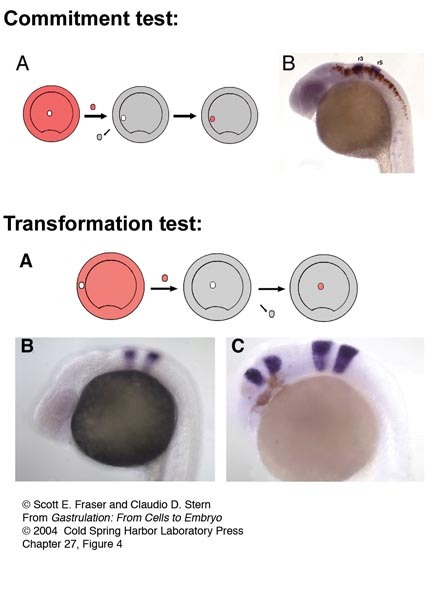 Four-hour timelapse recording of an intact Bodipy-ceramide labeled zebrafish embryo, beginning at midgastrula stage (7.3 hours postfertilization). 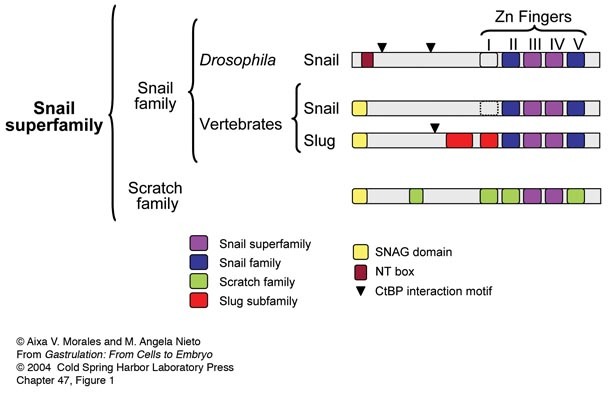 The notochord-somite boundaries become prominent about halfway through the movie, and following them clearly reveals the narrowing (convergence) and elongation (extension) of the domain (from Glickman N.S., Kimmel C.B., Jones M.A. and Adams R.J. 2003. 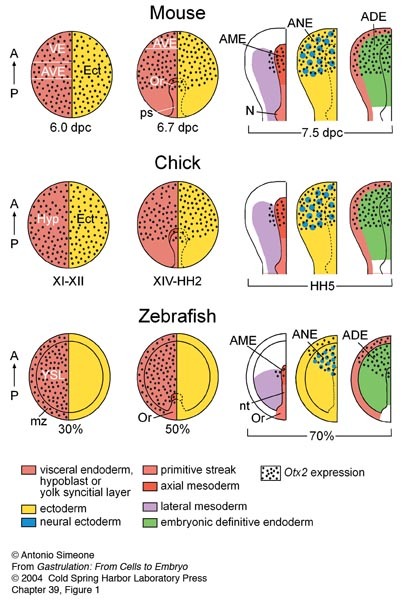 Shaping the zebrafish notochord. Development 130: 873-887, used with permission). 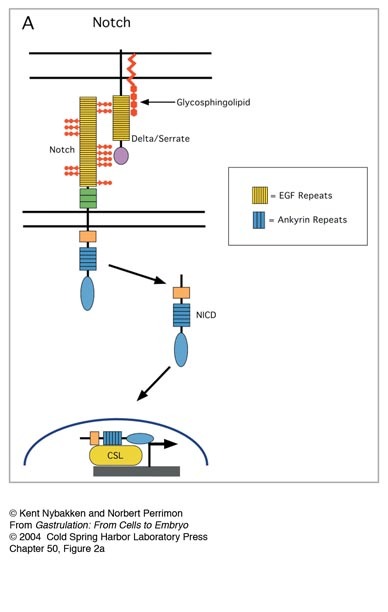 Cells reorganize during notochord convergence and extension. 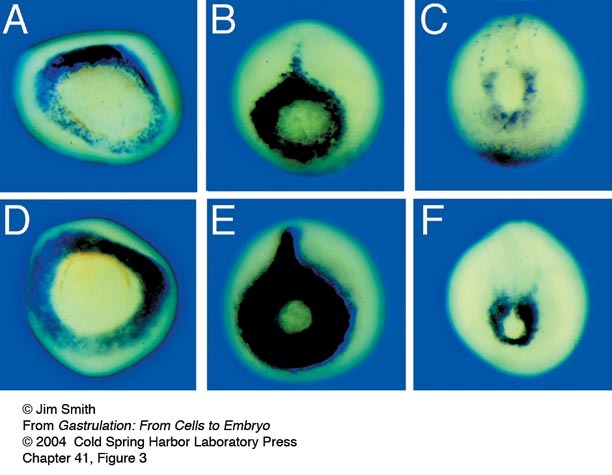 The cells were tracked from the timelapse data set shown in Movie 20_1. 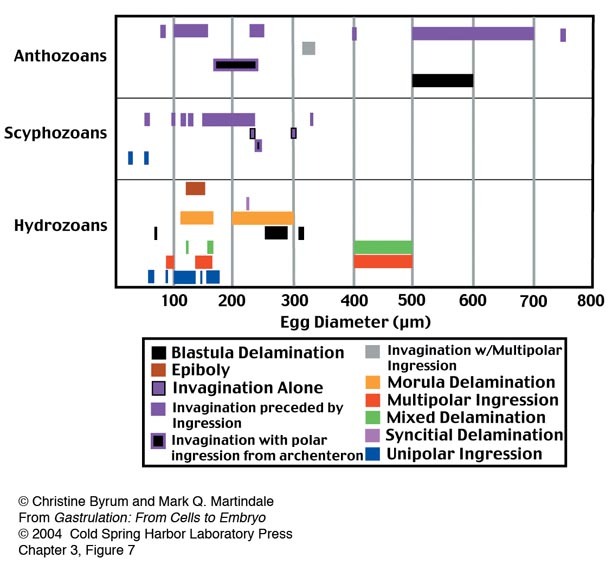 Figure 5 in the main text shows selected frames and describes the color coding. 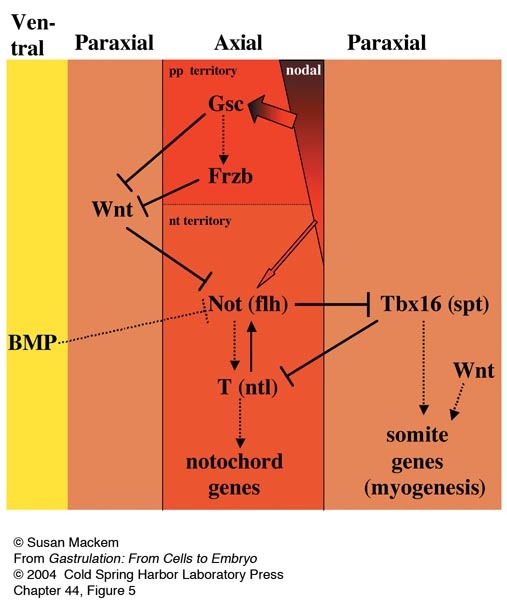 The prospective notochord (red) is present as a single domain long before the notochord-somite boundaries can be recognized (see Movie 20_1), and remains coherent despite massive cellular rearrangement across the entire field (from Glickman N.S., Kimmel C.B., Jones M.A. and Adams R.J. 2003. 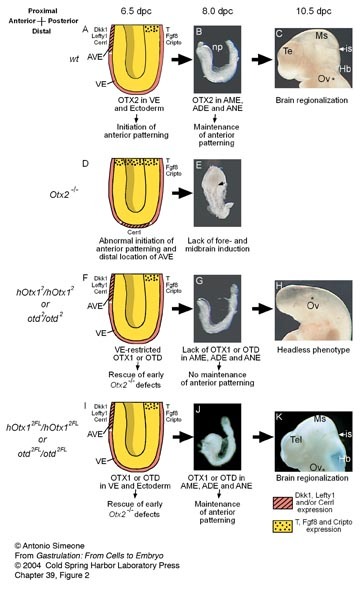 Shaping the zebrafish notochord. Development 130: 873-887, used with permission). 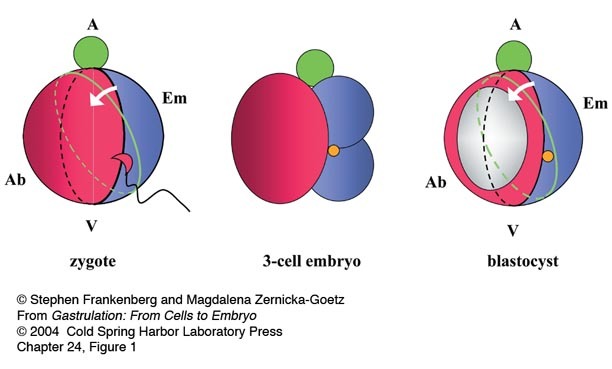 © 2004 by Cold Spring Harbor Laboratory Press and the authors of each individual chapter. All rights reserved. The reproduction, modification, storage in a retrieval system, or retransmission, in any form or by any means, electronic, mechanical, or otherwise, for reasons other than personal, non-commercial use is strictly prohibited without prior written permission. You are authorized to download one copy of the material on this Web site for personal, non-commercial use only. The material made available on this Web site is protected by United States copyright laws and is provided solely for the use of instructors in teaching their courses and assessing student learning. Dissemination or sale of any of this material, as a whole or in parts (including on the World Wide Web), is not permitted. All users of these materials and visitors to this Web site are expected to abide by these restrictions. 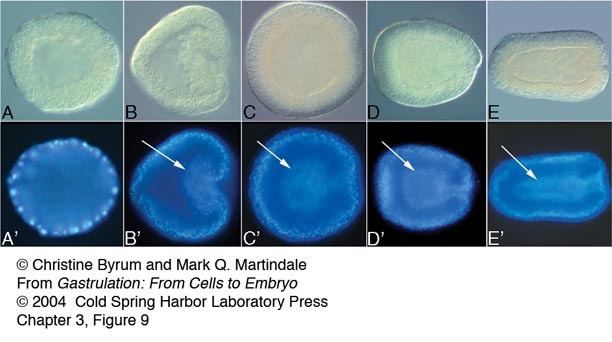 Requests for permission for other uses of this material should be directed to Cold Spring Harbor Laboratory Press, 1 Bungtown Road, Cold Spring Harbor, NY 11724 or submitted via our World Wide Web Site at http://www.cshlpress.com/.